Unfortunately even though I asked the twins father to stay to watch them blow out their candles he declined making an excuse that he was needed elsewhere and making a quick escape. I knew that it may take a while for Leo to be comfortable visiting for a while and I hoped that the two of us could become friends. I still had two boys who needed to celebrate their birthdays and I was determined that they would both have wonderful birthdays. 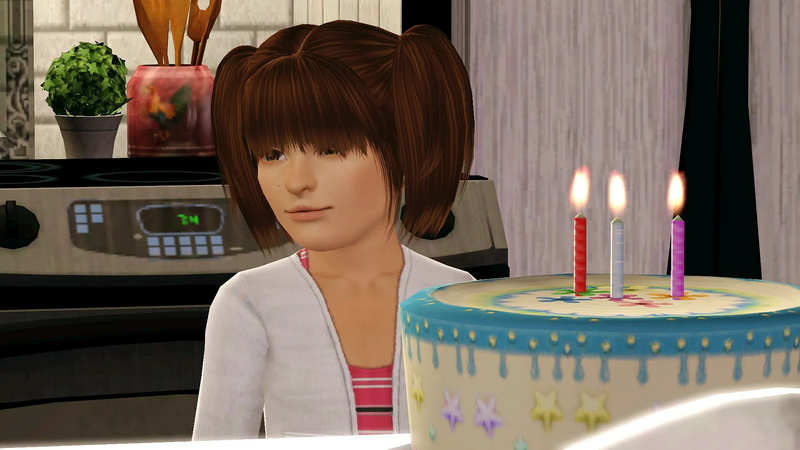 Ruby helped me by bringing Tangle out of the nursery and handing him to me so that he could blow out the candles on his cake. All of the boy’s older sisters came out to cheer them on. 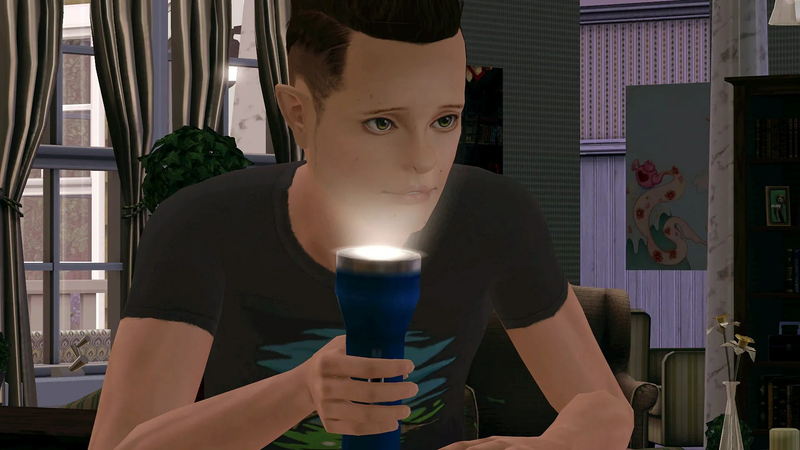 Tangle was the first to age up receiving the Light Sleeper trait for his birthday. It was then time for Teasel to age up. Teasel became an Animal Lover. 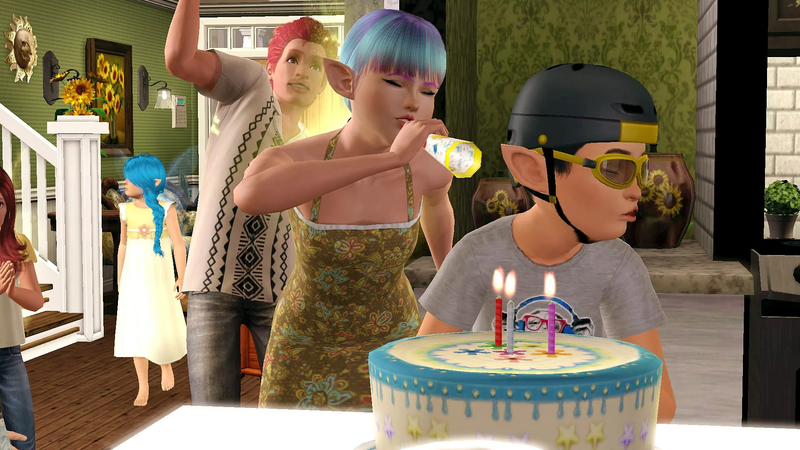 Teasel and Tangle were not the only two children in the house ready for their birthdays and I wondered why I had left it so long that my kids were all ageing up on the same day. 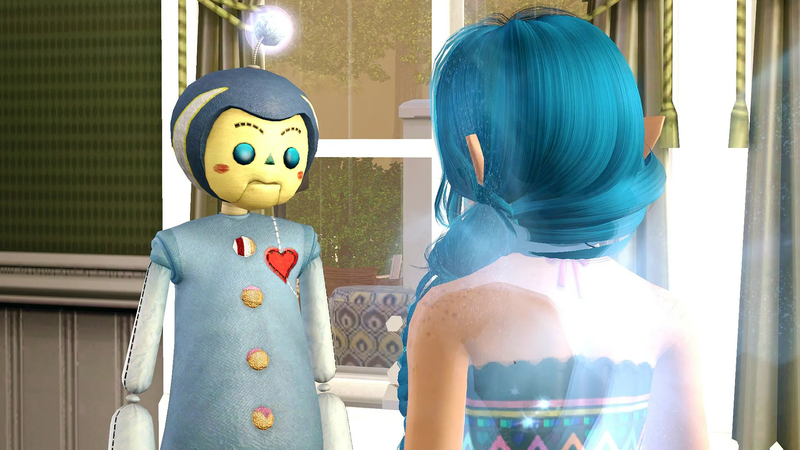 Moonbeam received the Perceptive trait. Bracken became a Vehicle Enthusiast. 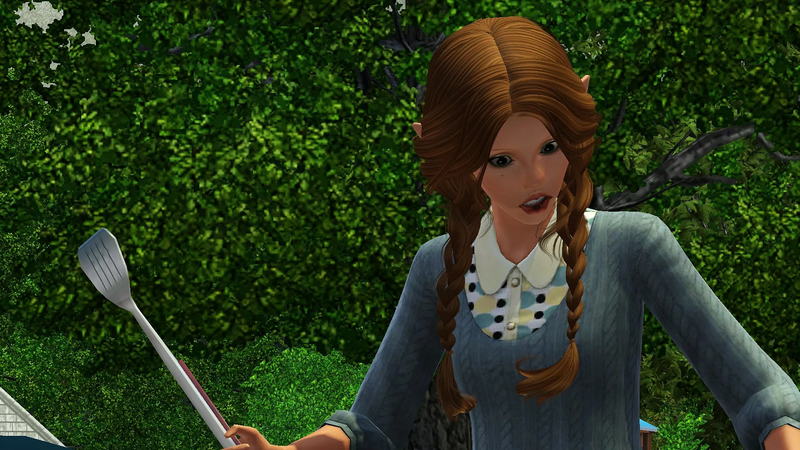 and Primrose received the Handy traits. 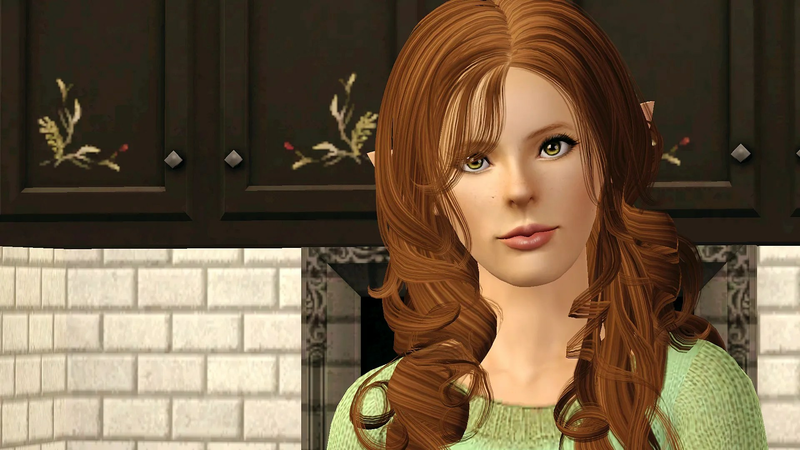 Prim like Ruby before her looked like my sister Haley. 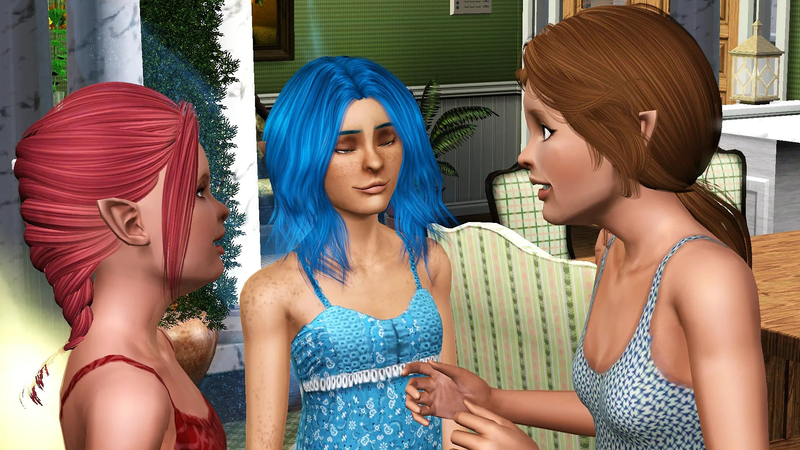 It was also time for Maple, Calla and Ruby to become Young Adults and just like it had with Finch and Tulip time had flown by. 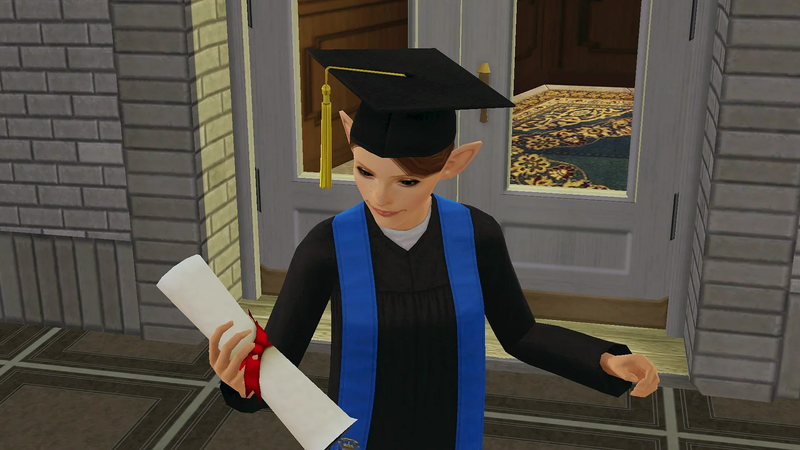 Calla aged into a beautiful young adult receiving the Bookworm trait. She hopes to become a Monster Maker. 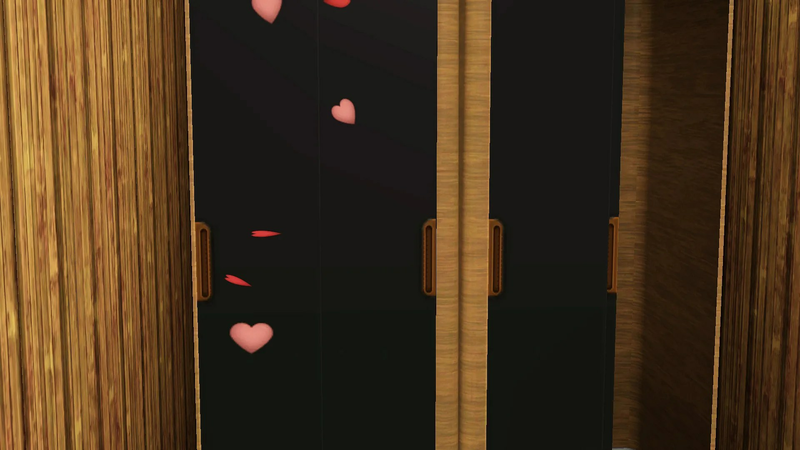 Ruby received the Shy trait. 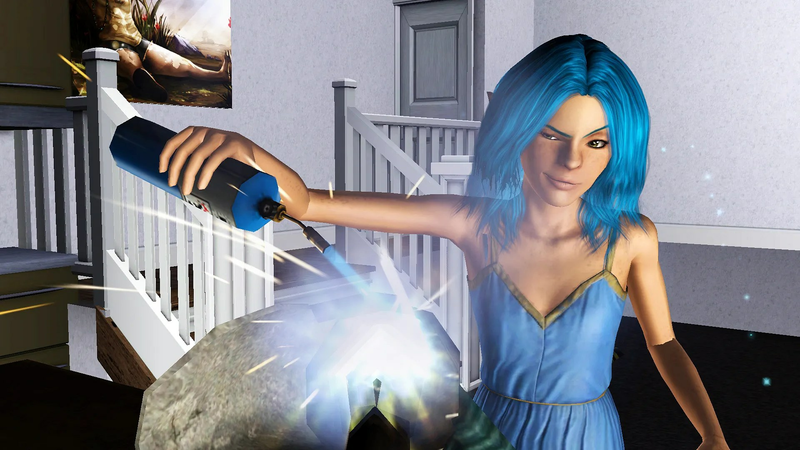 She has plans to give the community Magic Makeovers. 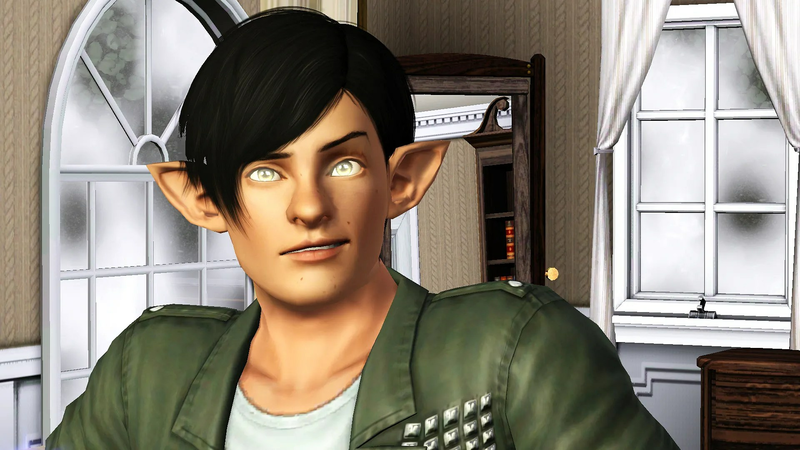 and finally Maple received the Eccentric trait. 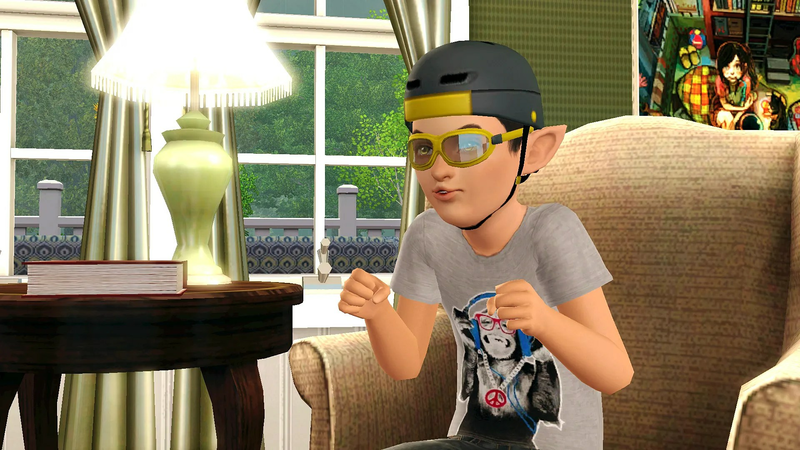 Maple’s Lifetime Wish is to become an International Super Spy. It seemed sudden but the older girls where ready to move out almost as soon as their younger sisters had finished aging up. They did stay and eat some cake but their one slice each barely made a dent in the now mountain of leftover cake now located in our fridge. One by One they came over to hug me and to say their goodbyes. 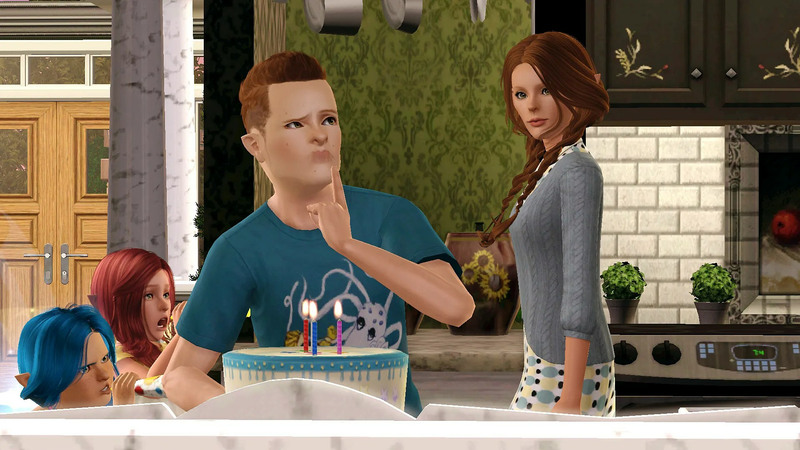 A/N: Yep, just an annoying birthday update but I loved how they all turned out. 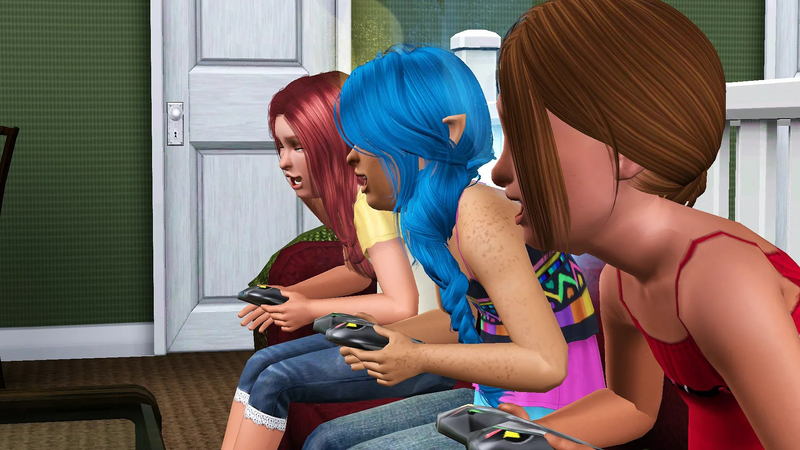 I had been going to start the boys training but decided that I really needed to get the girls out of the house instead. Maybe they would fight less if they had something to entertain them. 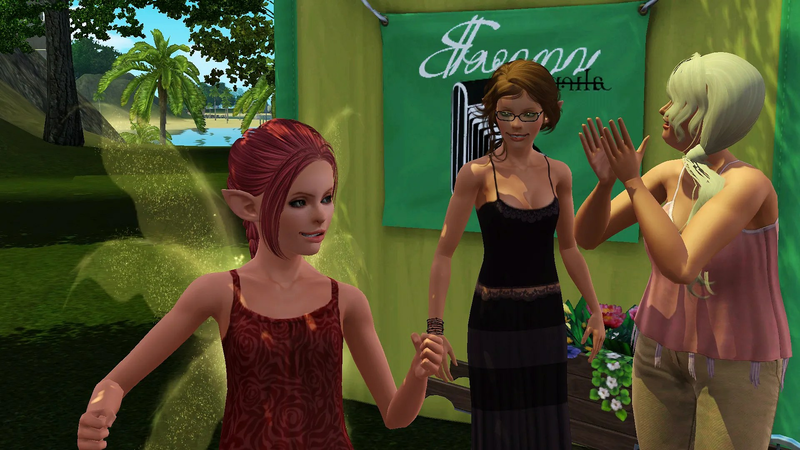 It was decided that we would all attend the local Evansdale County Festival which had recently arrived in town. When we arrived Bracken and Primrose disappeared almost immediately to play on the see-saw. I was happy to see that every one was keen to enjoy the festival and hoped that the girls would refrain from the bickering that had been plaguing my household. Ruby decided that she wanted spend the afternoon dancing and soon gained an appreciative audience. Calla and Maple took part in the pie eating contest. Maple was victorious on the day just beating her sister. and I finally had the opportunity to try roller skating for the first time in my life. Roller Skating had always been one of the activities that I had been unable to participate in. When I was younger my father and younger sister Erin had skated regularly. In someway I think it had been his way of pointing out to her that there were some advantages to being human. 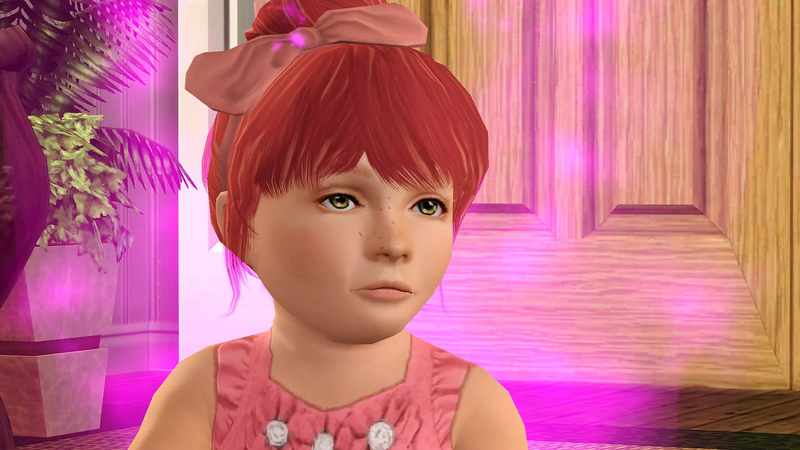 Ruby was joined by Moonbeam, she didn’t dance but decided to just watch. 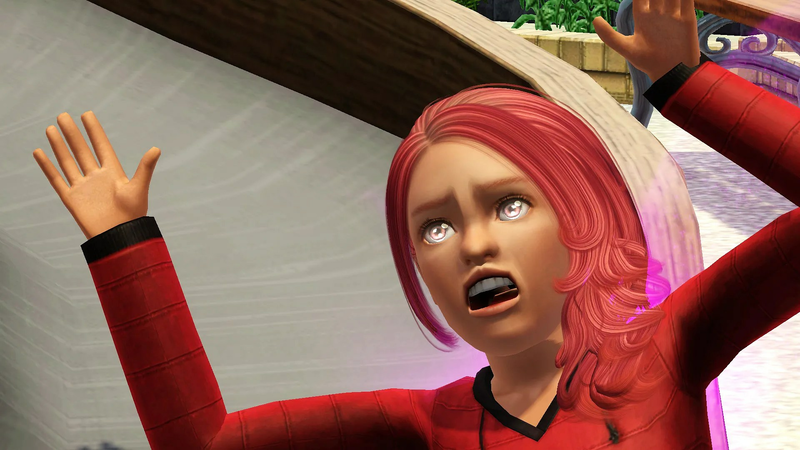 Calla wasn’t shy about dancing and she still showed the evidence of the recent pie eating competition. Maple decided to look after her younger brothers. Like Calla she hadn’t bothered to clean her face either. Eventually it was time to head home. It had been a tiring day and the kids were happy to just relax and play the gaming systems or entertain themselves quietly. I needed to get started on the twins toddler training and took advantage of the relatively quiet afternoon to get started. First up was Tangle with his walking training. 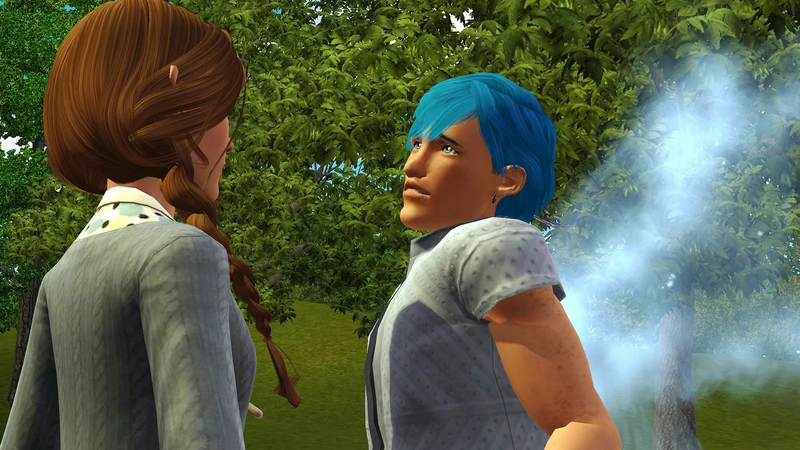 He learned quickly and I wondered if Maple had been trying to teach her younger brothers at the Festival. When Tangle was too tired to continue I got started with Teasel and started teaching him to talk. 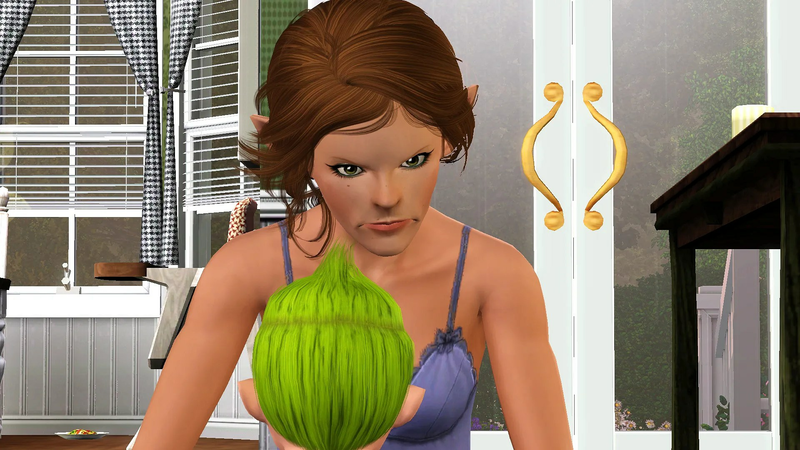 Training with Teasel did not go as smoothly as it had with his twin. Even after giving Teasel a small break training was going slower that I was used to. Teasel was capable but uninterested in learning. 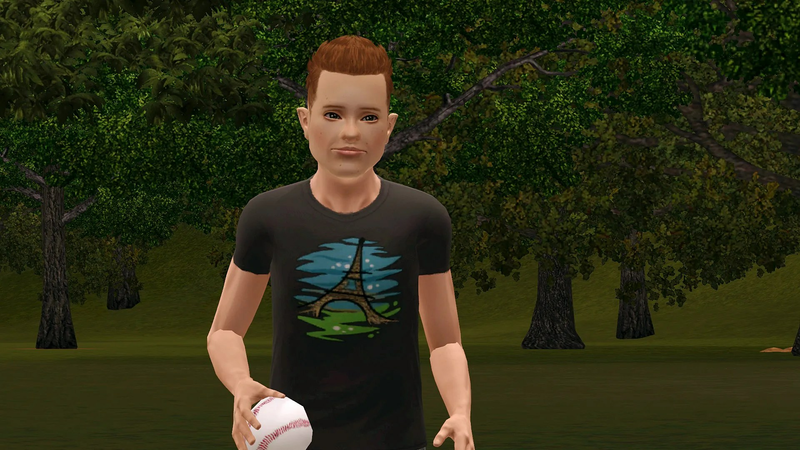 It had taken a while for me to complete the twins training but eventually they were ready to become children. 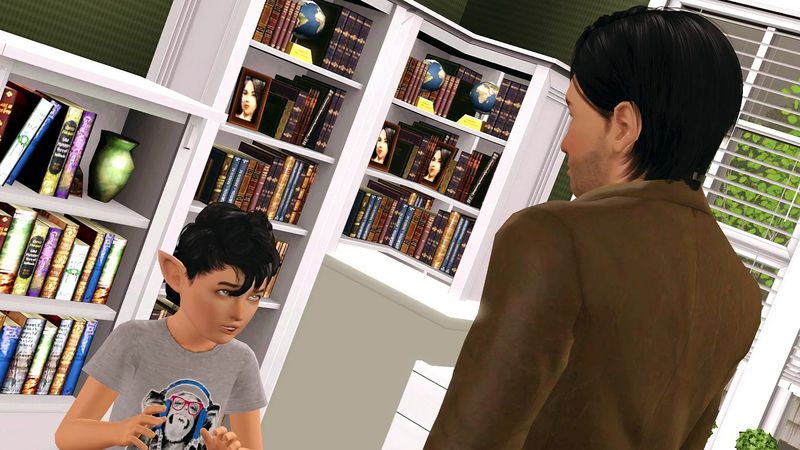 Leo came to visit again to see his sons and me and it was obvious that he thought that we had some kind of future together and I realised that he was going to force me to completely honest with me. I wasn’t ready for a permanent relationship, I wasn’t even ready to date if it didn’t involve my destiny. After putting Teasel to bed in his cot I went back out to the main room to break the news to his father. He took the news better than I expected. 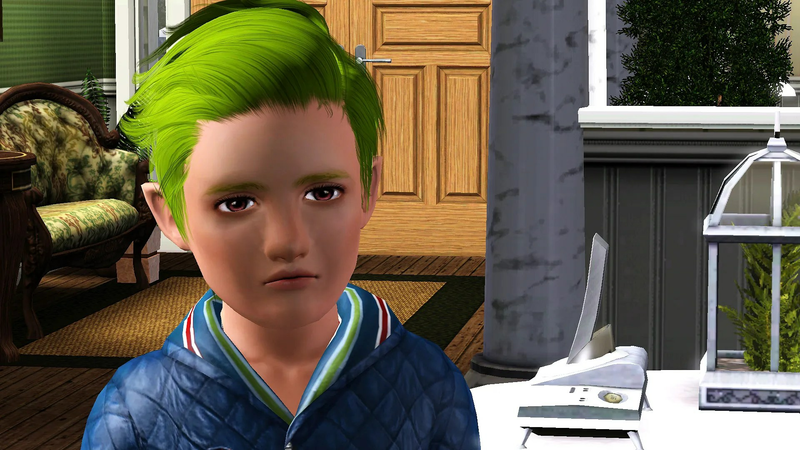 He was disappointed but didn’t get angry like Tulip and Finch’s father had. I was relieved by how well he took the news. A/N: Sorry it’s been awhile since the last update. 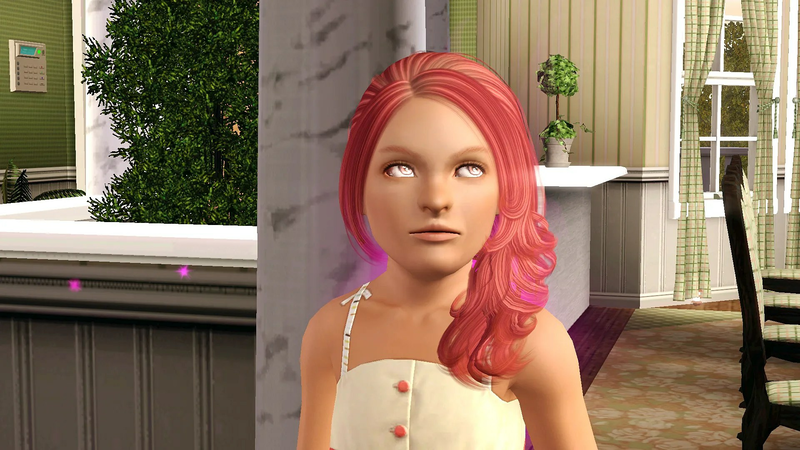 Sims 4 has taken away most of my interest for sims at all at the moment I haven’t even loaded any sims game for at least a couple of weeks. I’m not really 100% with this update, it was mostly done except for a couple of things and I only messed with it for about 10 mins before posting it. Hopefully it’s okay. Over the next couple of the days I made sure to spend as much time with my girls as I could. The newest babies wouldn’t be too far away and when they did my time with the older children would be diminished. They were all a little excited to be getting some new brothers and sisters. 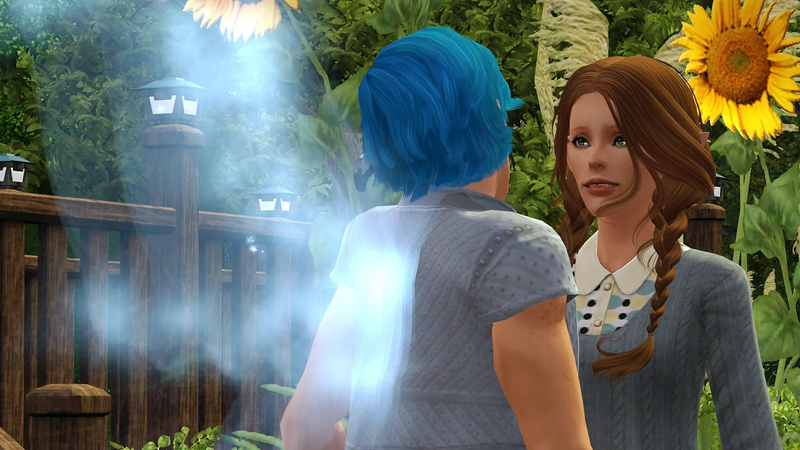 Primrose would randomly stop to give me a hug. When she wasn’t inside she was outside trying to overcome her fear of the slide. Later in the evening the older girls were off to their prom. While the girls were at their prom I received a surprise visitor. Leo had decided to pay me a visit to see how I was going. He was a little surprised at how big I had become. I was surprised when he kissed me and without allowing me to respond said he would see me later. It looked like Leo had taken our moment together far more seriously than I had. When the girls came home from their prom they were very excited. 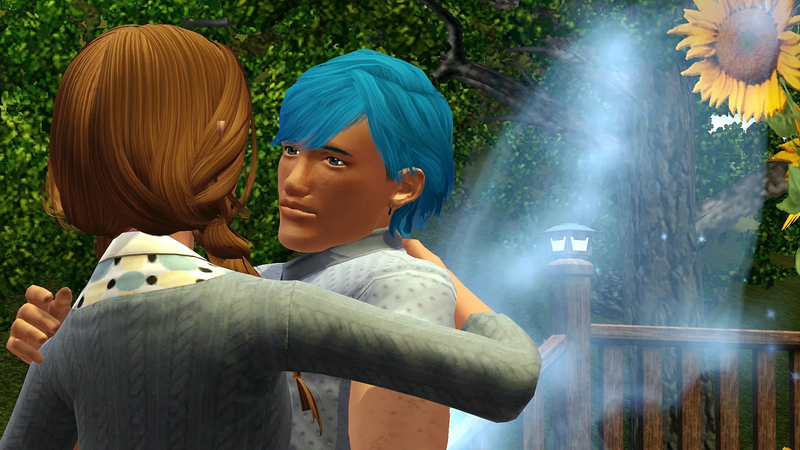 Calla had danced with a boy that she liked and had even received her first kiss. While Ruby had become Prom Queen. Unfortunately Maple’s night out had not gone as well as her sisters and she had even managed to be dragged into a fight. 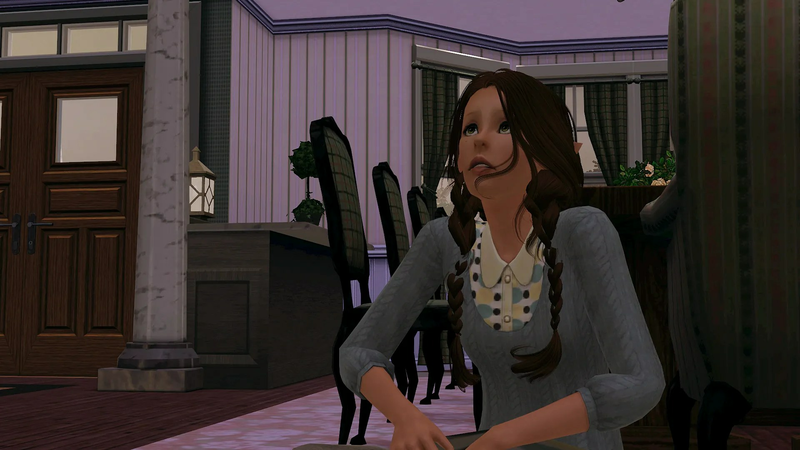 When she had got home she sat down in the kitchen and wouldn’t talk to anyone. Bracken had been waiting for the older girls to get home, refusing to go to bed until one of them had read her a bedtime story. Ruby agreed and it wasn’t long until Bracken was finally asleep. The next morning I found Calla busy reading in the family room. 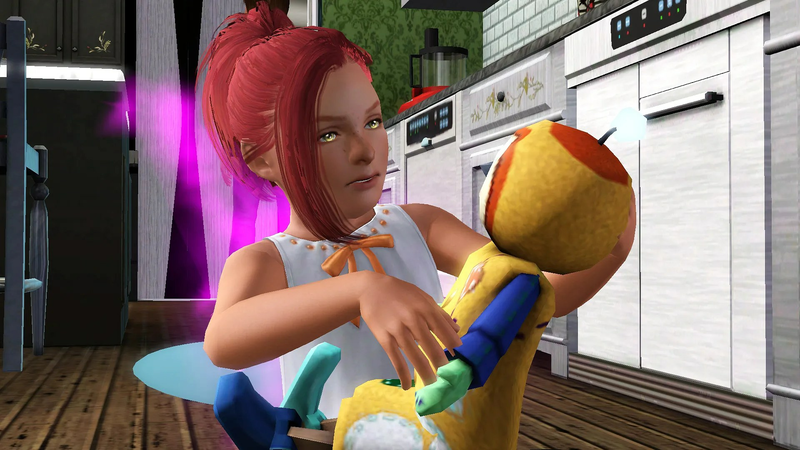 Bracken was happy playing with her favourite doll in the kitchen. Moonbeam and Primrose discussed their plans for the weekend. Which if it all went well would include a trip to the fair. Ruby was busy doing what Fairies do best, dancing. 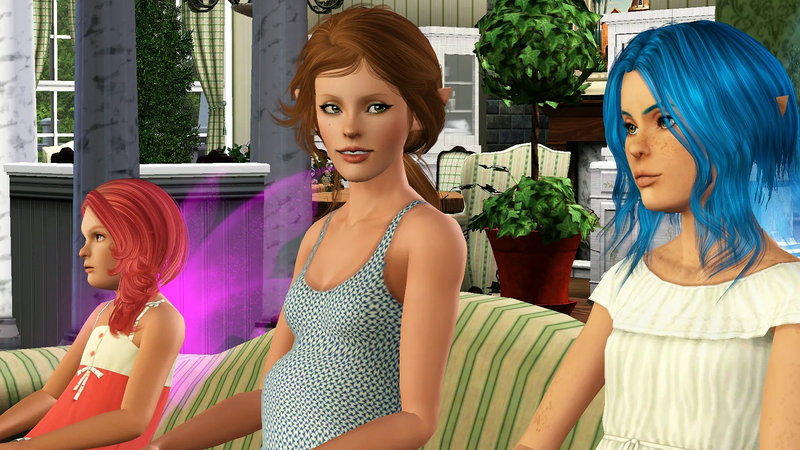 I joined Calla and Moonbeam on the lounge turning on television to watch my pregnancy addiction – cartoons. I was still watching television with the children when I finally went into labour. 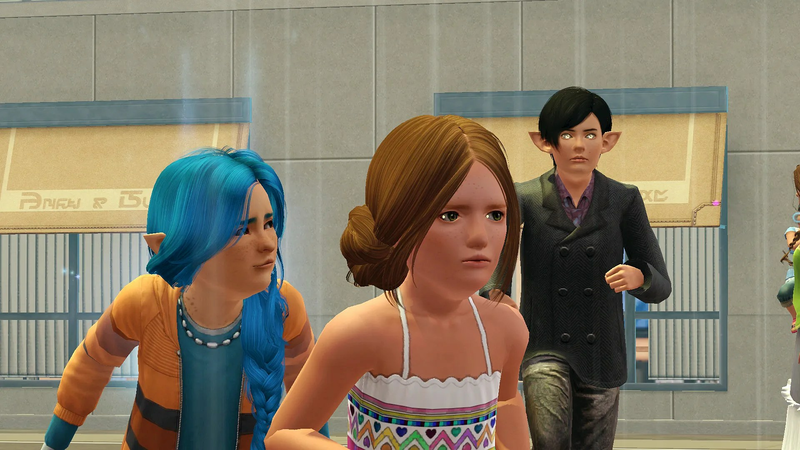 They gathered round to help and Ruby was really upset. 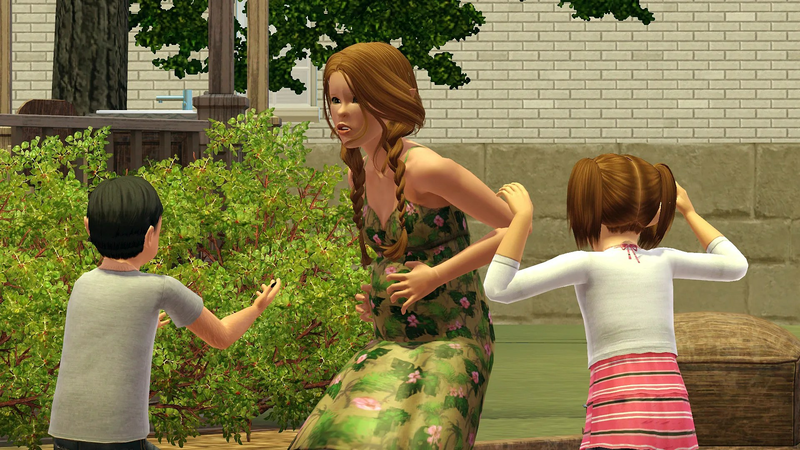 Out of all of my daughters Primrose was the least excited about becoming a big sister. Soon I had two new baby boys. 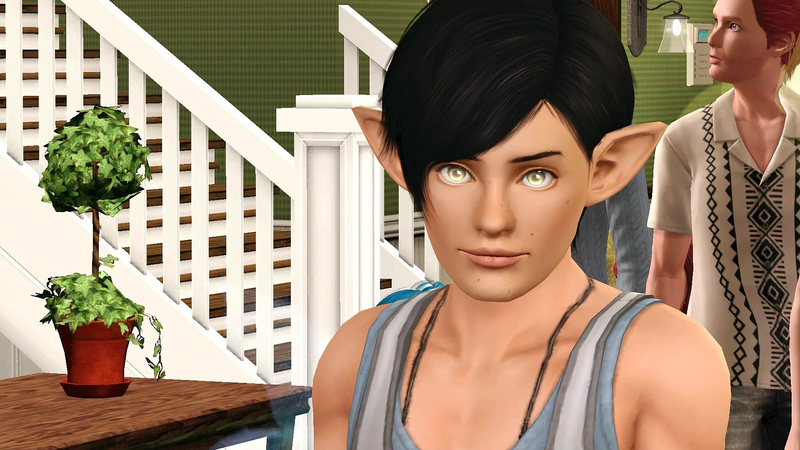 Teasel who was born with the traits Athletic and Loves the Outdoors. and Tangle who has the Artistic and Good traits. With the twin settled I went outside to look after the other new additions to the family, the chickens. A couple of days ago I had purchased a Chicken Coop. I still have no idea why as it just gives me one jobs I have to do each day and I don’t have enough time in the day as it is. The girls had promised they would look after our new pets but this stopped on almost the first day. 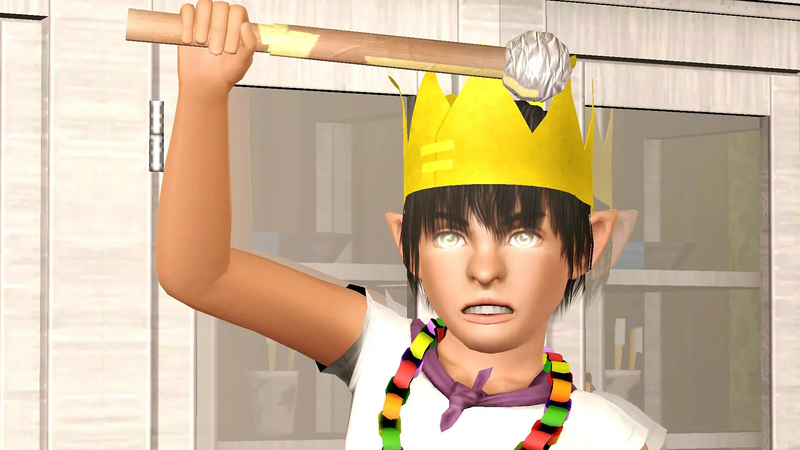 Inside Moonbeam was once again pretending she ruled an entire kingdom. 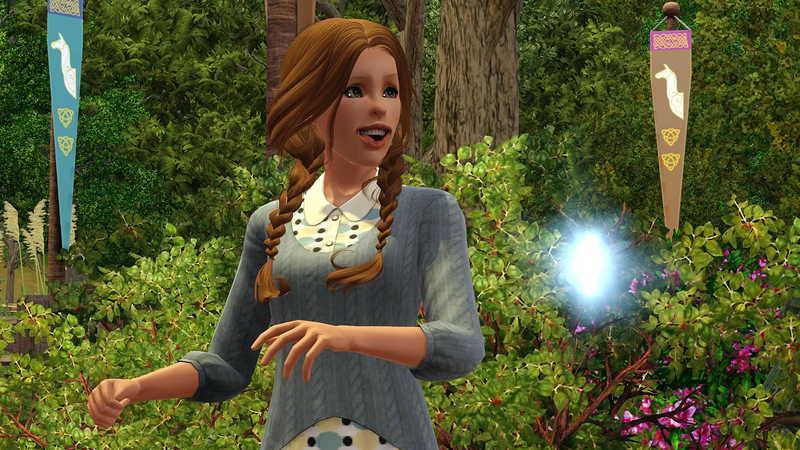 Calla was busy practising her magic. 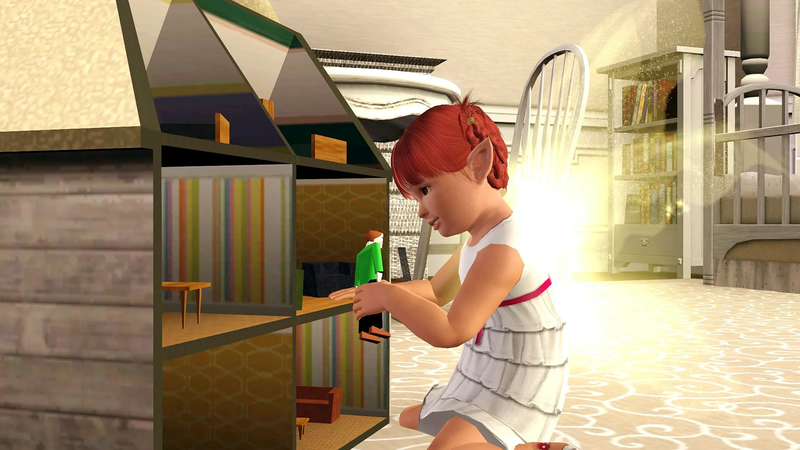 and Ruby was in a mood and was busily fairy trapping the house. Maple was finally ready to talk about the events of the previous evening. Even having set numerous fairy traps when I had been a teen – I still don’t seem to notice when I’m the one who’s about to be tricked. Ruby had been in my bathroom rigging the traps in my showers. and the trap she had set caught me completely unawares. I don’t think turquoise is my colour. Ruby had made herself scarce when I emerged from the bathroom and only reappeared when Teasel had claimed my attention. “Ruby! Did you trap the shower in my bathroom? 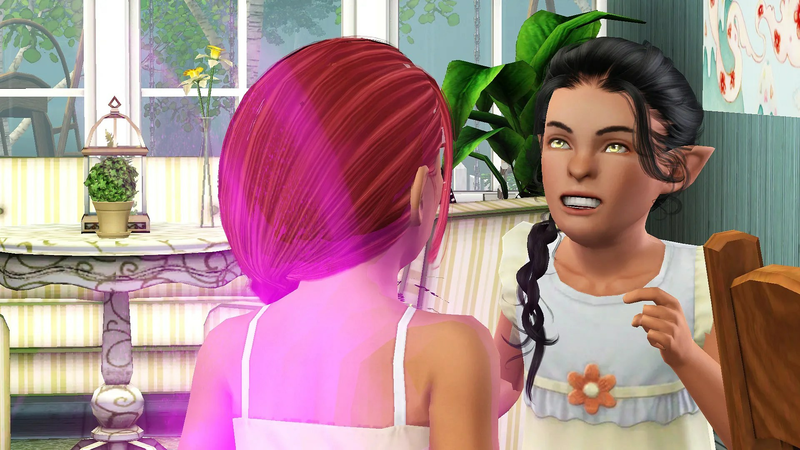 After saving Novus from freezing to death I came back inside to find an argument already brewing between Ruby and her younger sister Bracken. 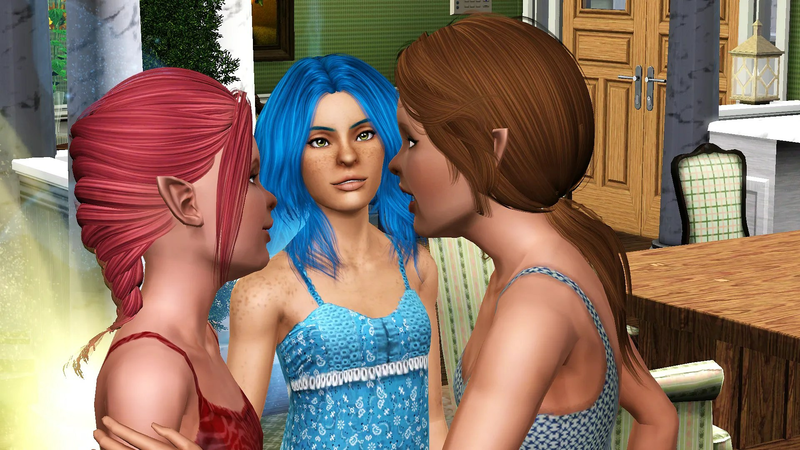 At the moment they just seemed to be tricking each other like I had once done with my sisters so I decided to let them work it out by themselves. 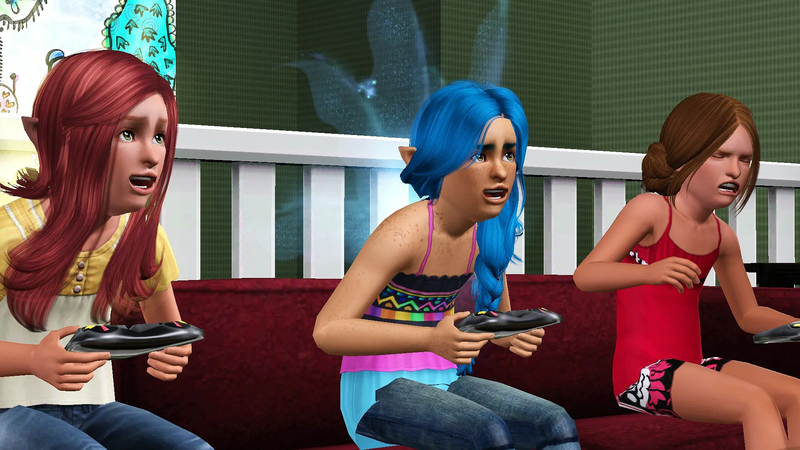 Ruby wasn’t impressed with her sister’s trick. 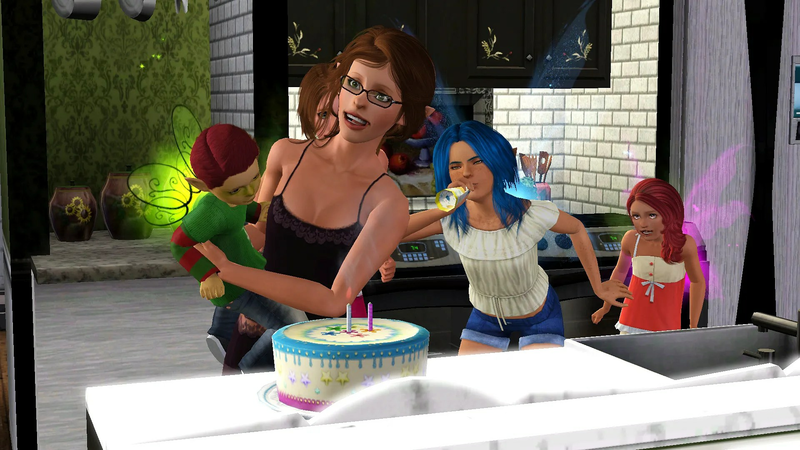 As they were arguing I decided that I needed to age up the Ruby, Calla and Maple before it all got out of hand, Calla was the first of the triplets to reach the cake. 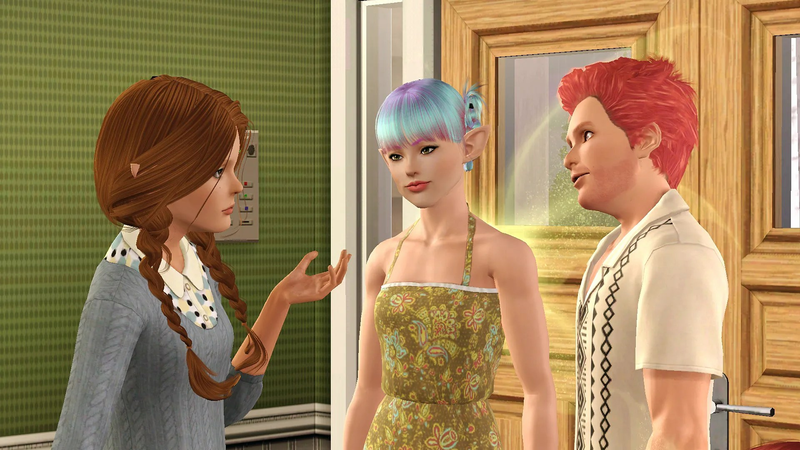 Ruby received the Ambitious trait. and Maple received the Neat trait. With the birthdays finished everyone continued on with the day. 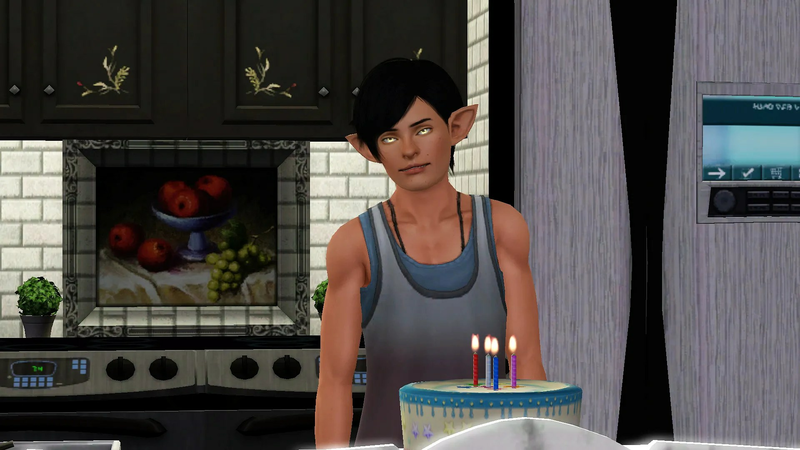 Novus was in the middle of one of his feral moments when I discovered that I was pregnant and I realised I had one more birthday to celebrate today. 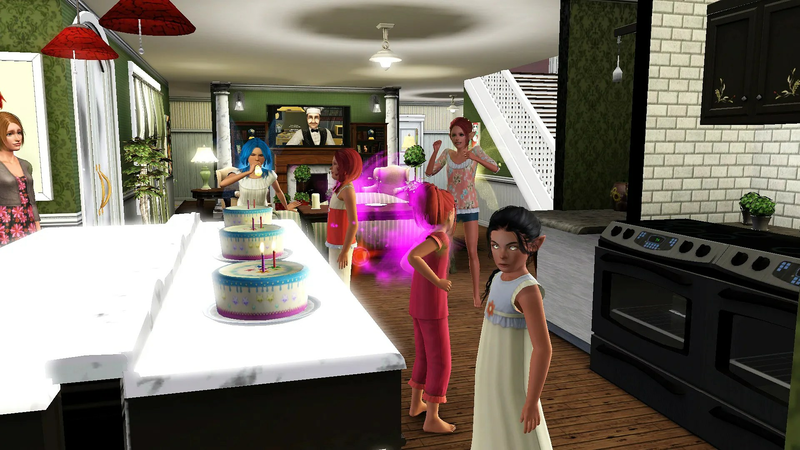 When he finally regained control and returned to his human form we all crowded into the kitchen to celebrate Novus’ birthday. 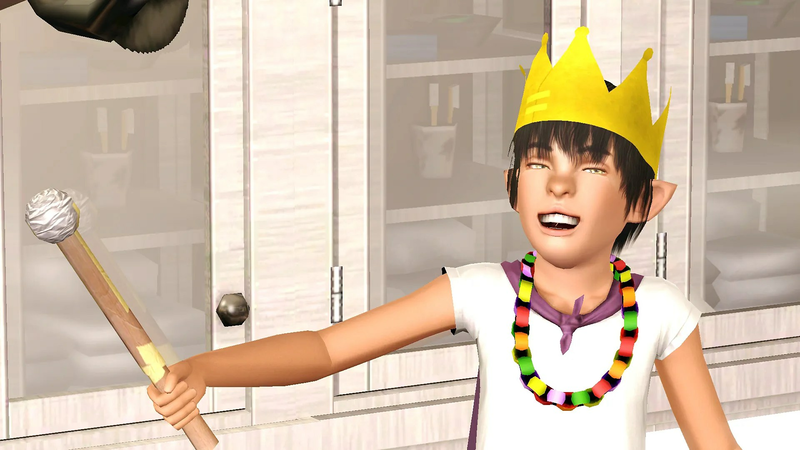 Novus became the first ever Young to receive the Bot Fan trait. He wants to become Leader of the Pack. 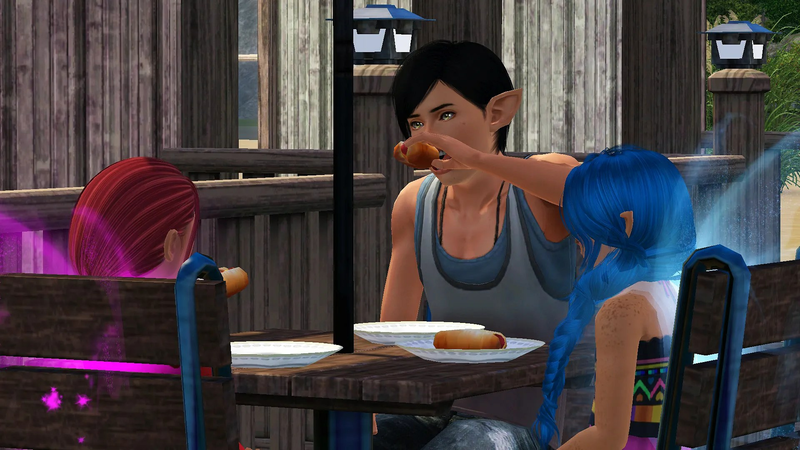 Six little sister’s had obviously become a little too much and Novus decided he was ready to move out. 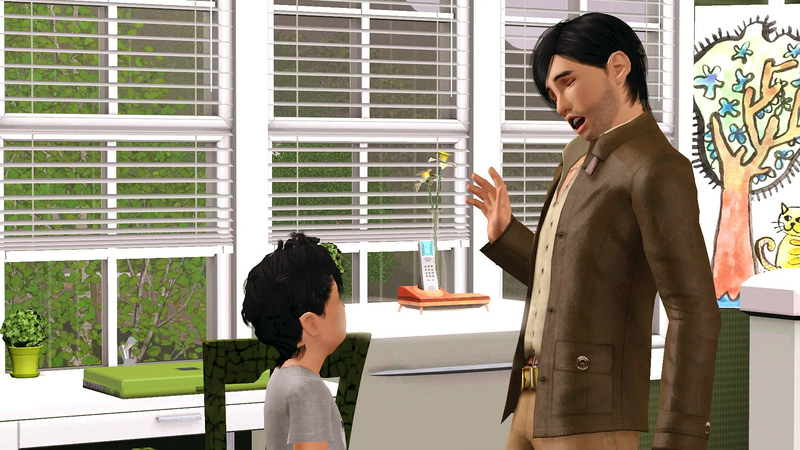 He is going to live with his father Leon. 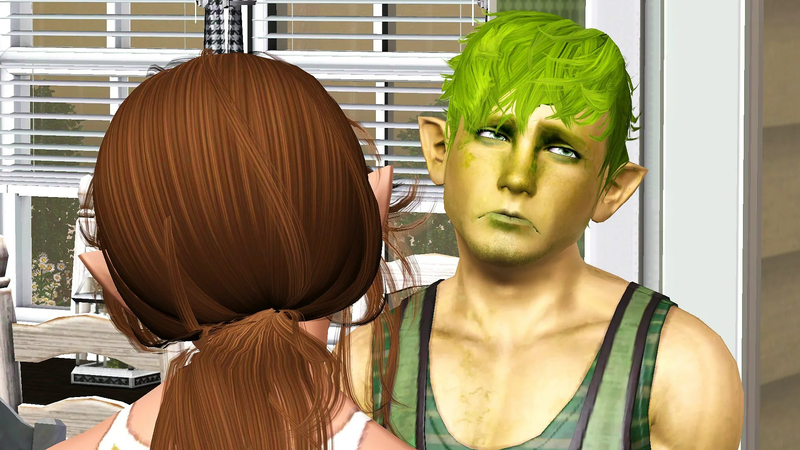 Ruby became Over-Emotional when Novus announced he was leaving. 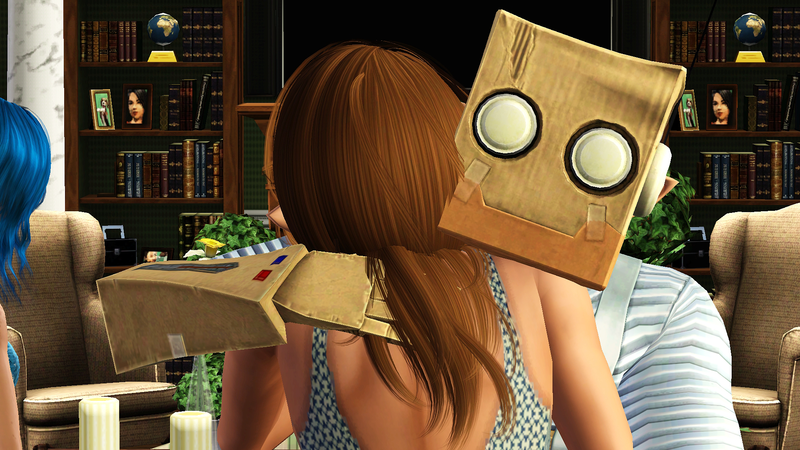 I think she wanted to see more of him in his Bot costume. Primrose requested a bedtime story and I was happy to read one to her. Calla was happy to read to her little sister. Bracken also wanted a bedtime story and I was soon reading Bracken her favourite story. One story was not enough and she also requested story from her big sister Maple. After two stories she was finally went to sleep. 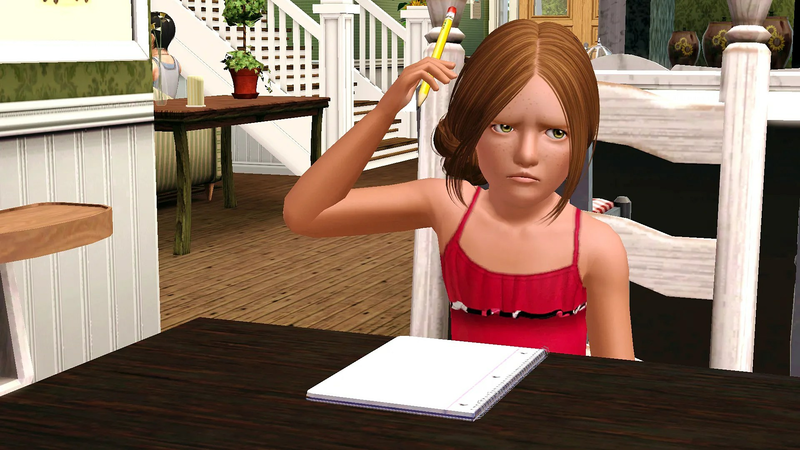 Calla and Maple got started on their homework. They weren’t happy about it but at least it was getting done. With her homework done my eccentric daughter Calla asked if she could use some of the scrap and try out some ideas on my work table. I agreed and Calla spend the rest of the night working at the table. 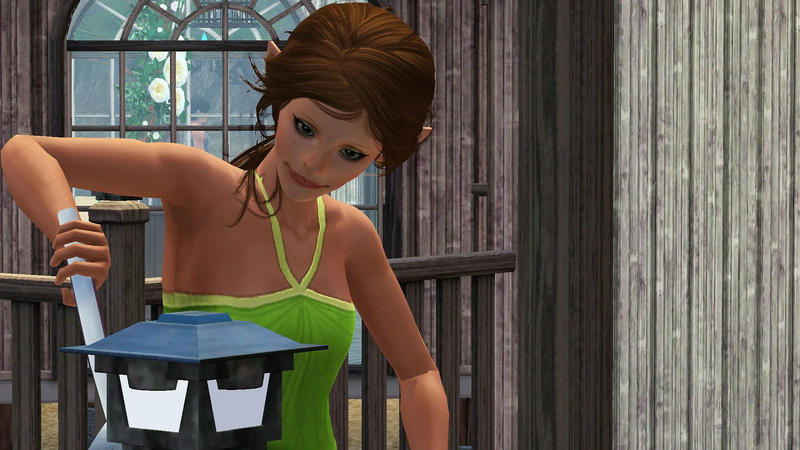 Ever since she had been a baby she had been obsessed with making things and she was finally old enough that I could let her try her hand at the table. After a couple of hours Calla had a giraffe statue to show for all her hard work. Like me, I could see her creating for many years to come. 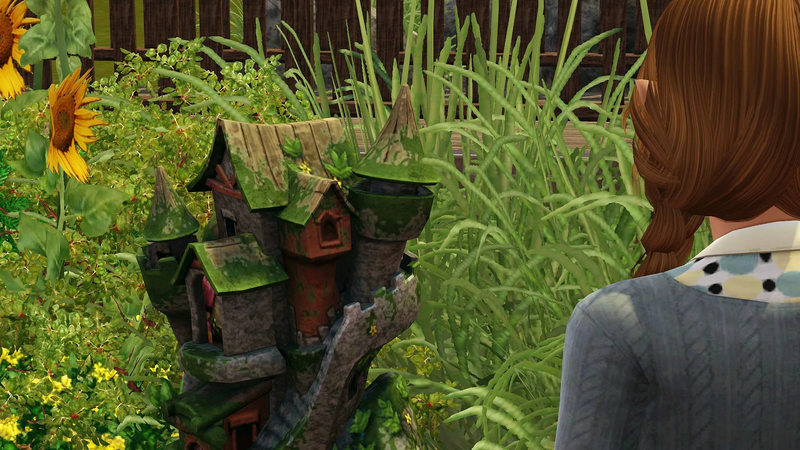 A/N: I realised halfway through this chapter that I kept mixing Primrose and Bracken up. Whoops. Hopefully I picked up all of the times I mixed them up. 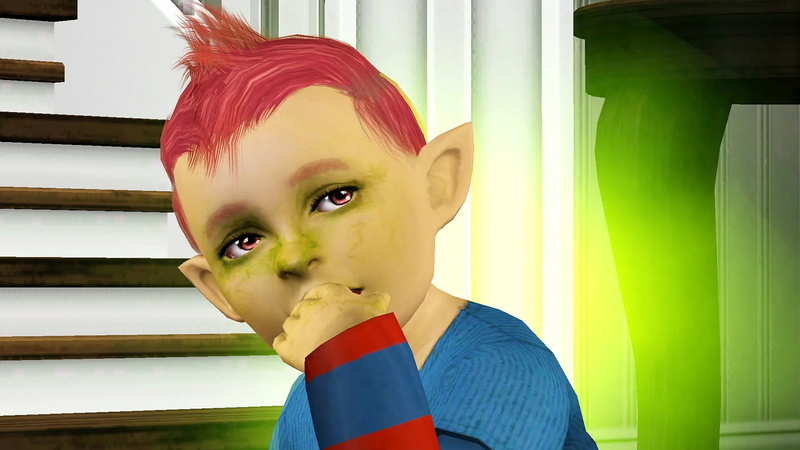 I don’t know if it will help anyone but Primrose has Pink eyes and Bracken has yellow. They look alike as children but thankfully are a lot easier to tell apart when they become teens – except suddenly it’s Primrose and Ruby that are difficult to tell apart (thankfully Prim and Ruby have different coloured wings). 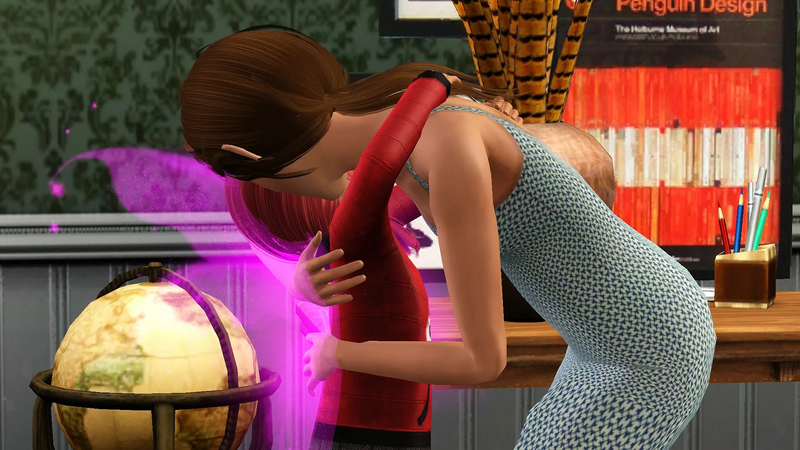 After I said goodbye to Tulip and Finch my mother pulled me aside. 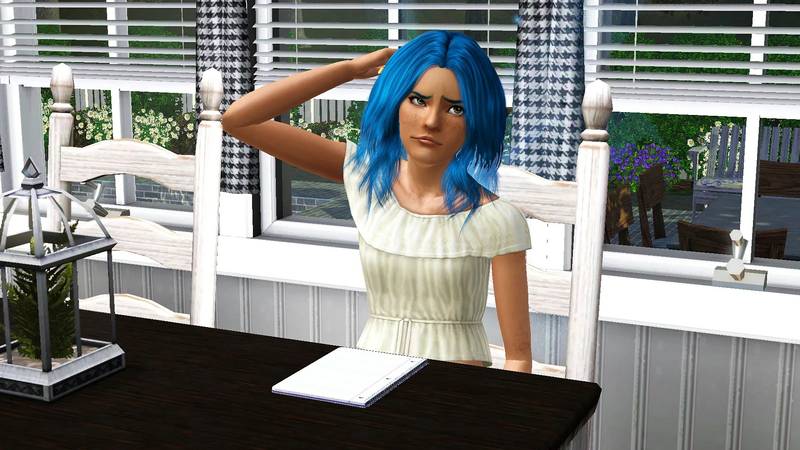 “Jo, why don’t you go out somewhere and relax we can look after the kids tonight,” Eliya said. 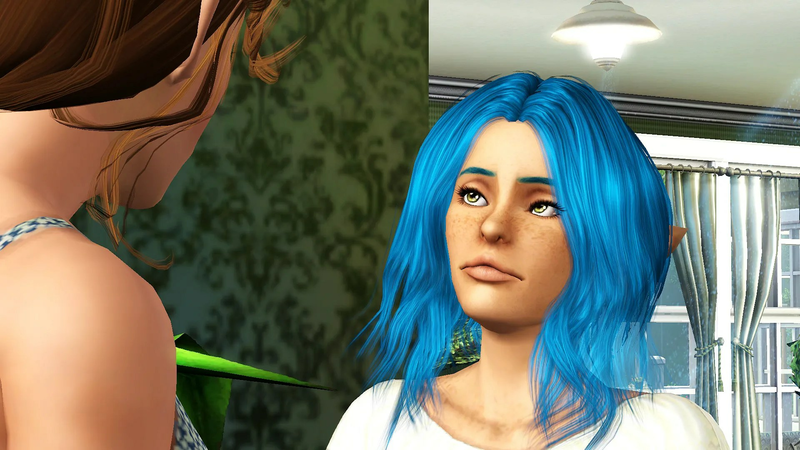 “Really mum?” I glanced at my father. Did they know what usually happened whenever I managed a moment away from my kids? The idea made me a little uncomfortable. When I finally reached it I was glad that I had remembered to bring along my swimming costume as one of the bars was in the pool. I looked around the area to see if anyone was about. 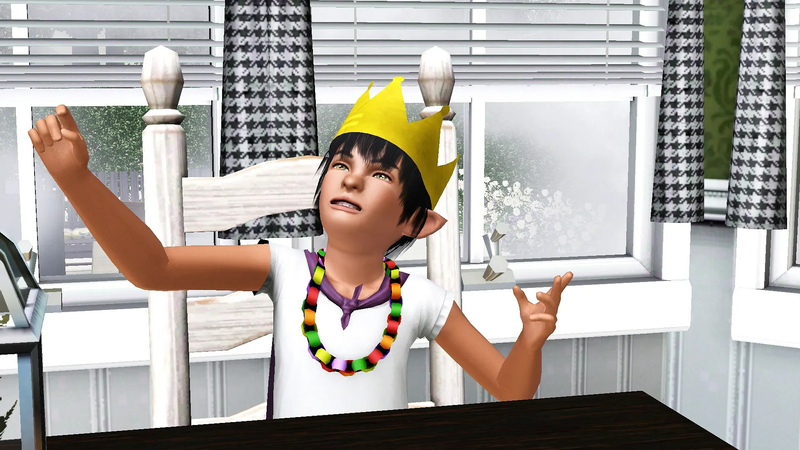 Lets face it, Tulip and Finch had moved out and Novus would not be far behind them and in the morning Prim, Moon and Bracken would be celebrating their birthdays – I needed a man. The most likely looking candidate was at the pool bar so I went over to introduce myself and order a drink. He introduced himself as Leo and when we had both finished our drinks he took my hand and led me over to the side of the pool. He leaned back and closed his eyes while he waited for me to get in. 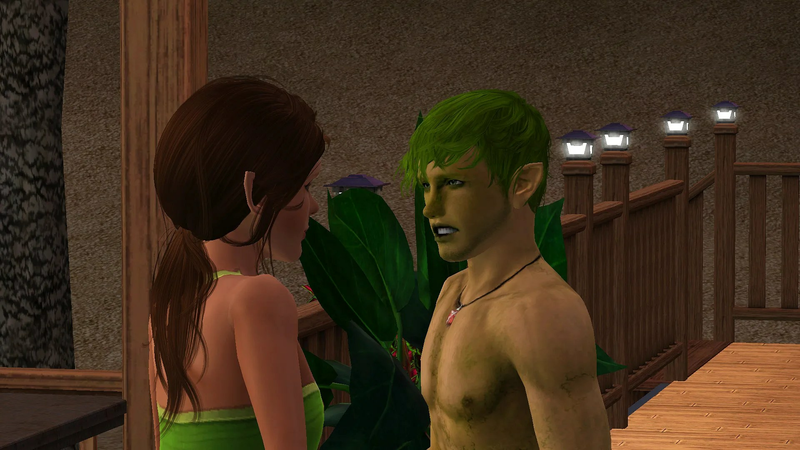 I glanced around, decided I was brave enough and after a brief struggle with my clothing joined Leo in the spa. Leo didn’t seem at all put off by my sudden nakedness and put his arm around my shoulders. We stayed in the spa for a while getting to know each other. 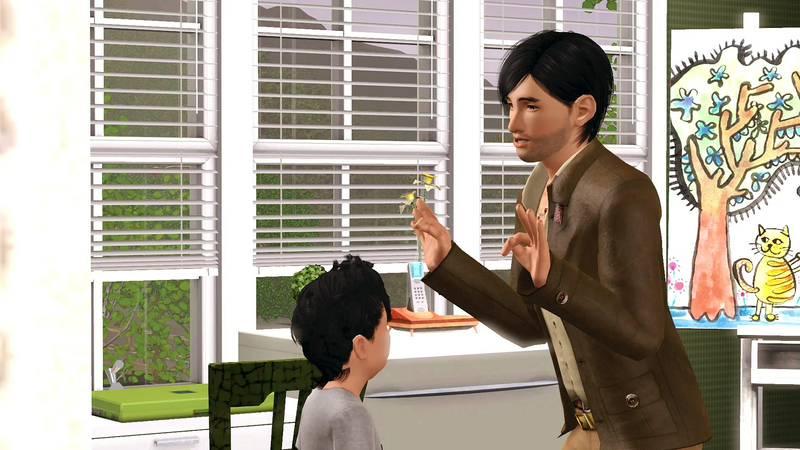 After a while I got impatient with the delays dragged Leo out of the spa and kissed him, it was always dangerous getting to know my children’s potential fathers and this time I didn’t want to allow myself time to get attached. 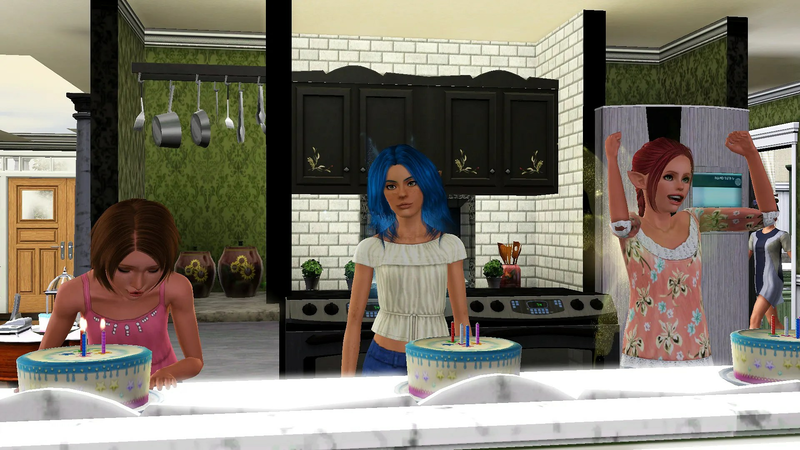 It was time for the triplets birthday. My parents stayed and help me out with the birthdays. 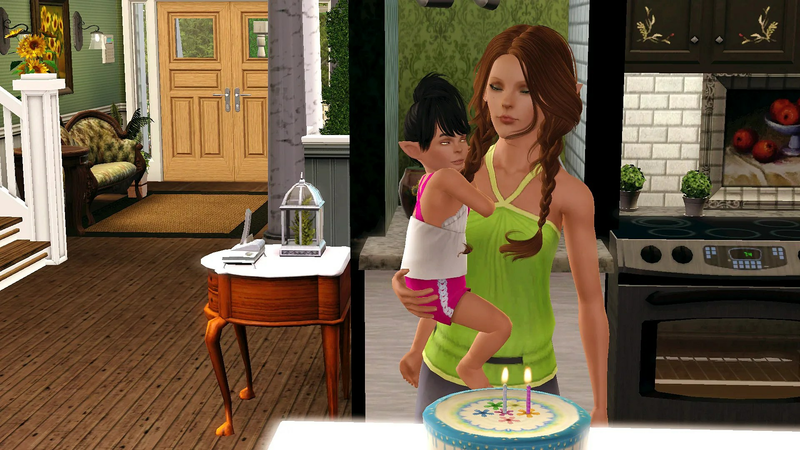 My mother Eliya brought Primrose to her cake, while I took care of Bracken and Moonbeam. 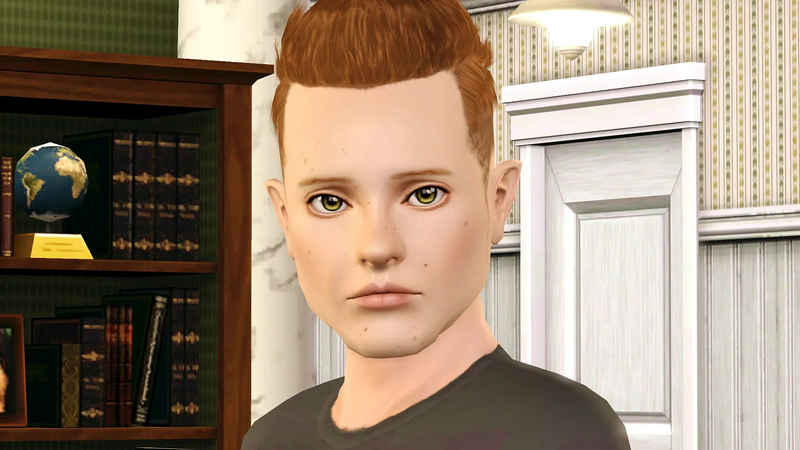 Bracken received the Proper trait. 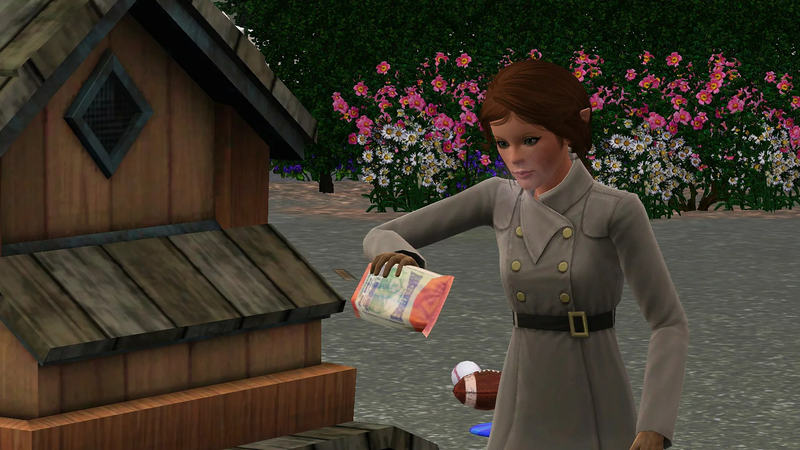 Primrose received the Mooch trait. 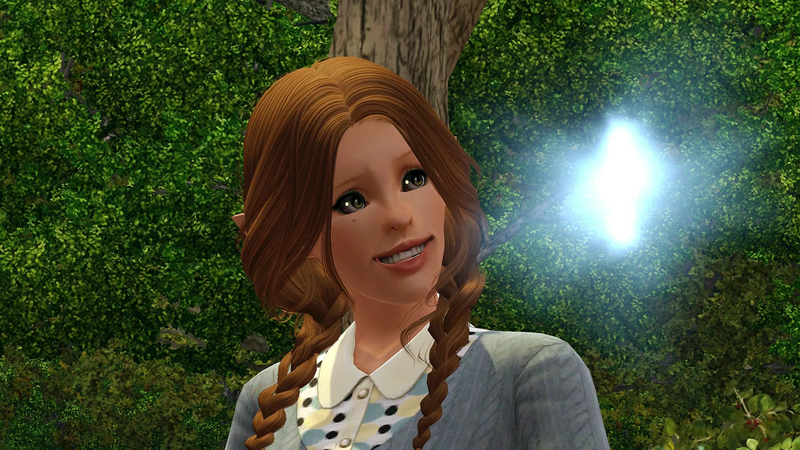 Moonbeam received the Excitable trait. After birthdays were complete I decided to get the kids out of the out of the house and go down near the water to eat lunch. 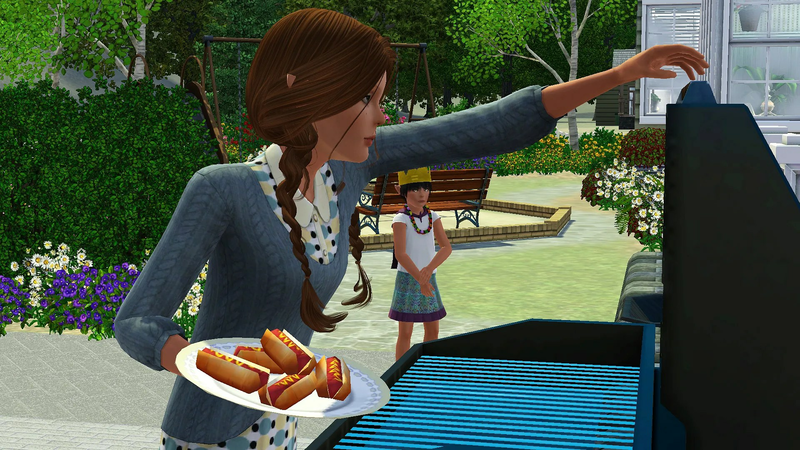 I made hotdogs for everyone and all of the kids seemed to enjoy them. After a couple of hours we all headed home, mostly tired but happy. Moonbeam seems to have an almost boundless energy and spent the afternoon pretending to be our Queen. Because everyone was exhausted and didn’t really feel like cooking something for elaborate for dinner I once again made hotdogs. I accidentally dropped one, hopefully no-one noticed . 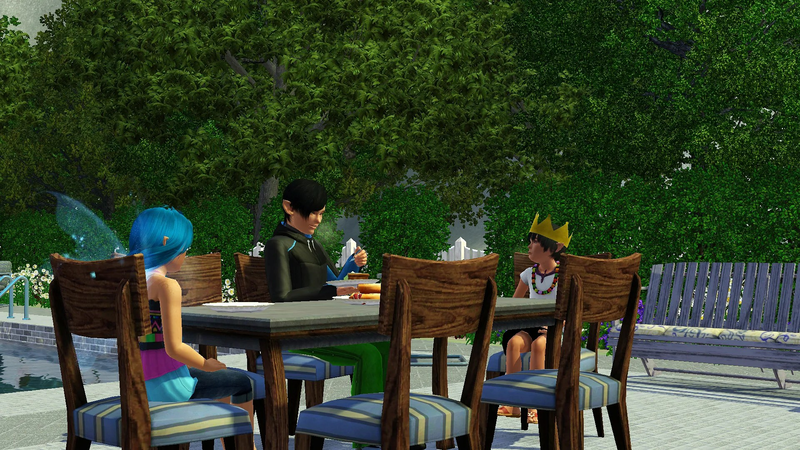 I served the hot dogs to the kids out by the pool. 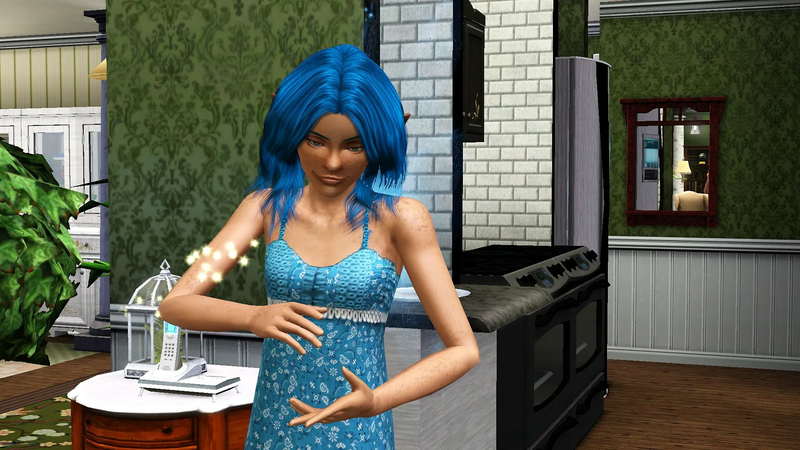 Moonbeam seemed to have been the only one who had noticed my little accident but she didn’t tell her siblings. 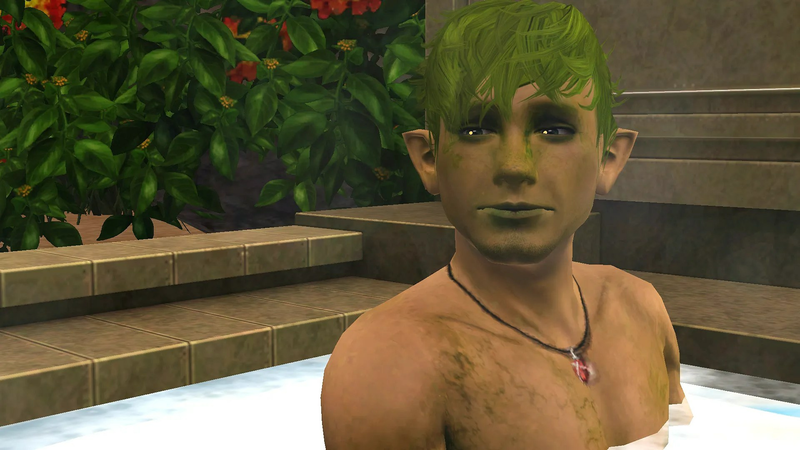 Novus decided to spend some time in the pool afterwards. He stayed in far longer than was wise. It was still spring and sometimes the evenings would get cold, far to cold for Novus to stay outside in the pool. A little while later I realised that Novus had not come back inside and went out to find him. After a quick search I found him half-frozen just outside the pool and after locating my hairdryer tried to thaw him out. Hopefully he has learnt his lesson and won’t stay out for quite so long again. I hadn’t seen my parents since I had moved into town to start my unusually large family and I think that they were just as excited as I was to be present for the children’s birthdays. While I was busy getting everything ready for Novus’ and the twins birthdays, my parents were busy introducing themselves to their grandchildren. They had spoken to the older kids on the phone occasionally but this was the first time they had been able to visit. Ruby introduced herself in an unusual manner but my father rather enjoyed her method. 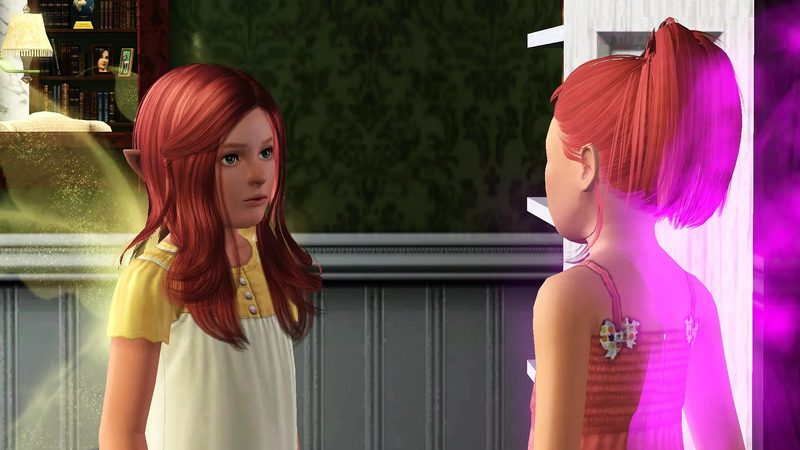 “We have the same colour hair!” Ruby said excitedly to her grandfather. Mum had a special present for Tulip. Fairy Dust that she had collected herself and thought that Tulip might like. 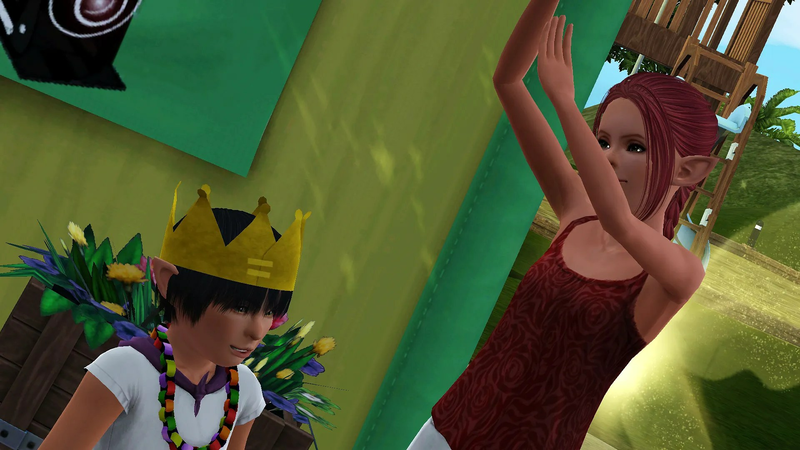 Novus was the first to age up with his grandparents enthusiastically cheering him on. He received the Coward trait. 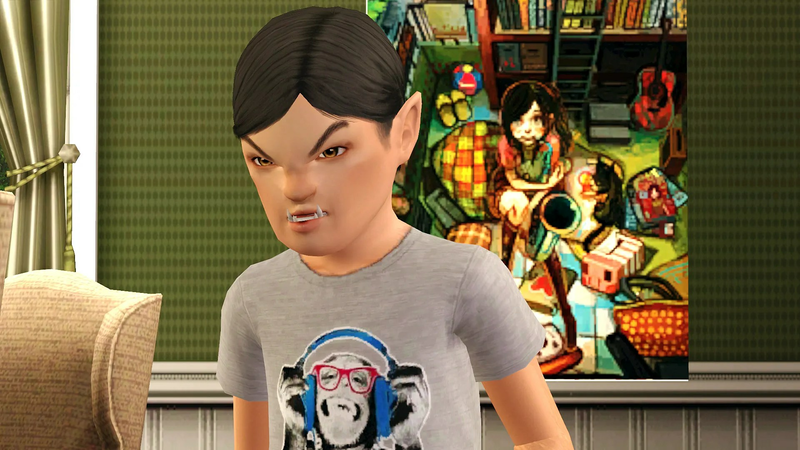 I was suddenly glad that other than Novus himself, I only one werewolf in the household. And then it was time for the birthdays I had been dreading. Since the moment they had been born. 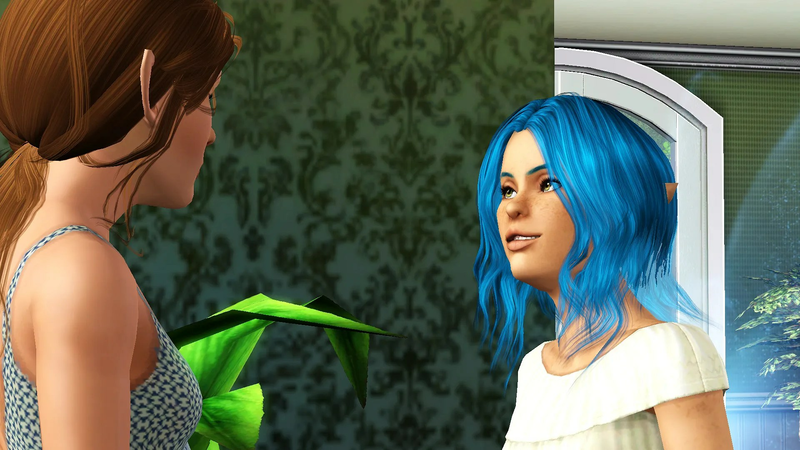 Tulip aged up into a beautiful young woman receiving the Party Animal trait as her final trait. When she graduates she plans on becoming a Cat Herder. 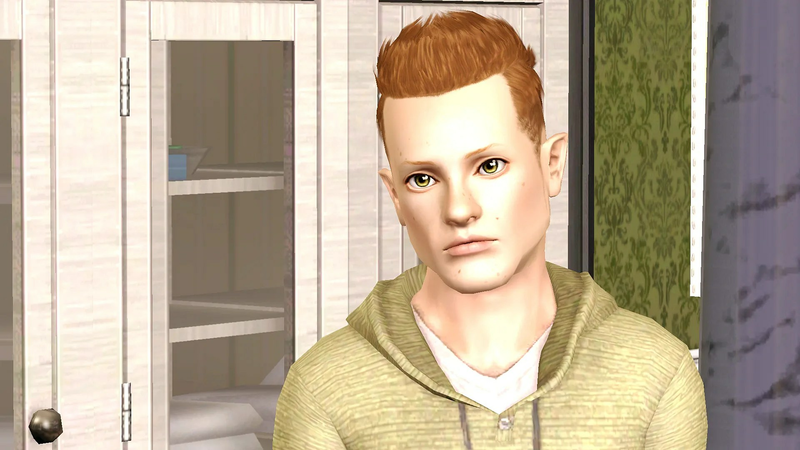 While Finch suddenly reminded me a lot of his father. Finch aged up with a new appreciation of cold weather trait and a wish for winter to arrive soon. 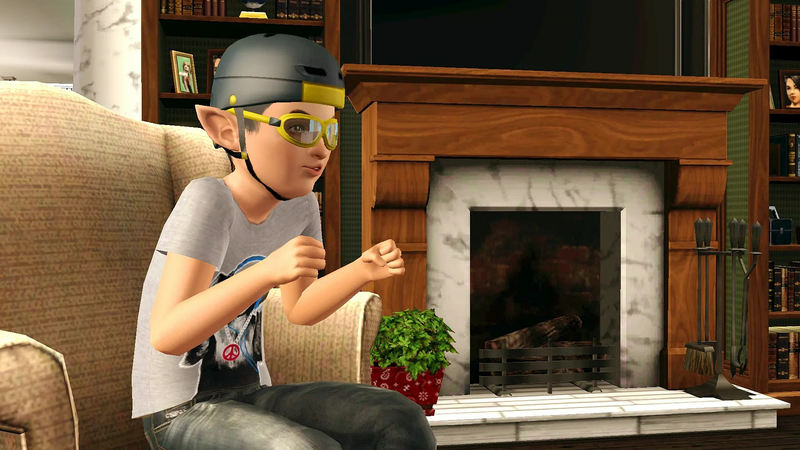 He wants to be a Scientific Specialist. 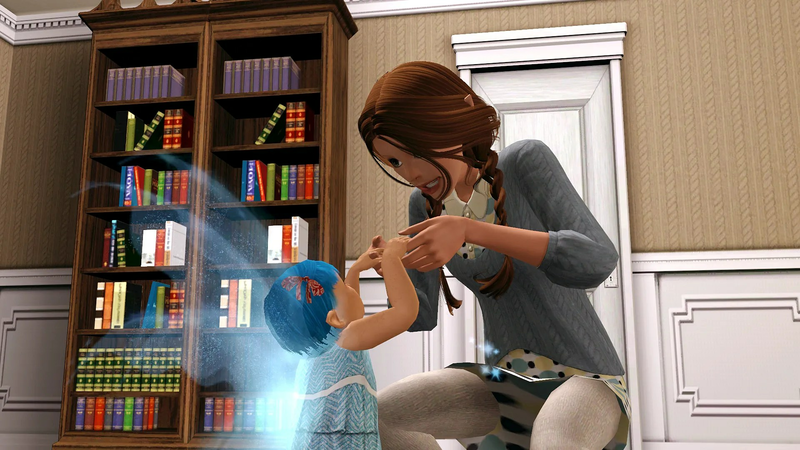 As we waited until it was time for Tulip and Finch to graduate, my parents soon found the toddler’s in the nursery. 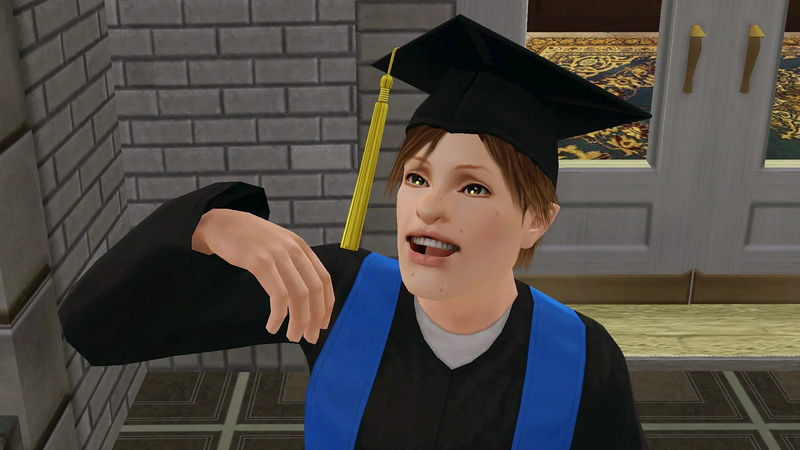 Marshall decided to terrify Moonbeam with his version of the claw. 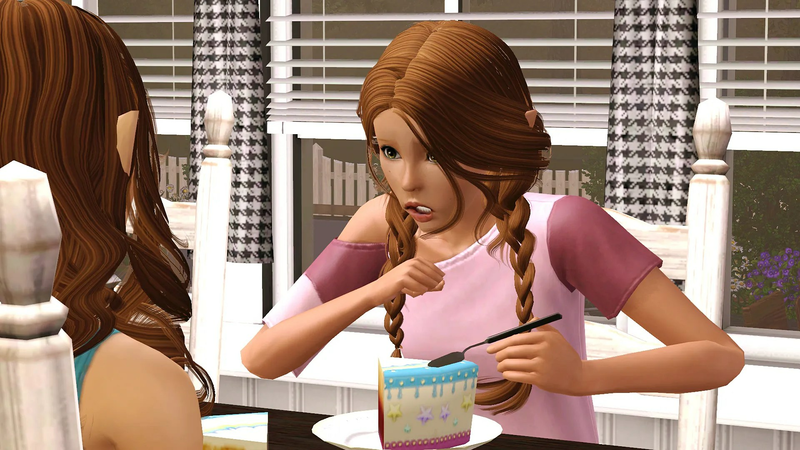 The older children found other things for themselves do, although Maple didn’t appear to be happy finishing her homework. 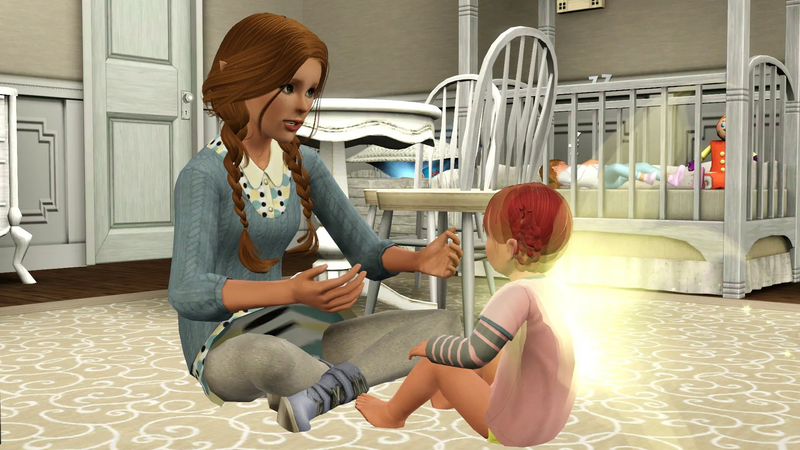 After Eliya had finally managed to pry Moonbeam out of my father’s arms she decided to help out and started to teach her to talk, having trained both her own six children as well as several of her younger siblings she was practised at teaching children the skills they would need. I finally had a chance to spend time with Bracken and she was soon on his way to talking. 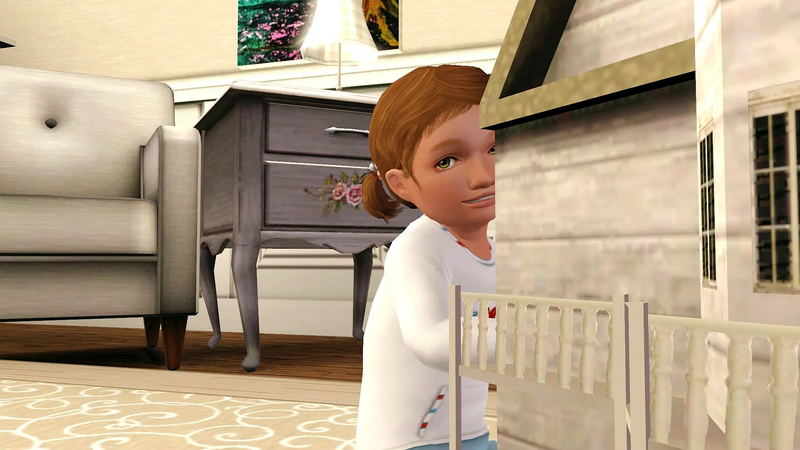 Last to finish all of her toddler training was Moonbeam which I completed just before both I and my daughter went to bed for the night. 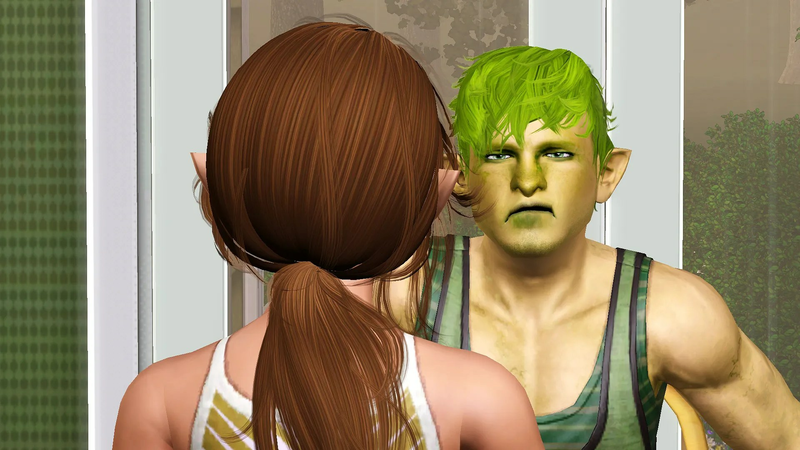 The next morning following a rush on the bathrooms as everyone tried to get ready – we all attended Finch and Tulip’s graduation. 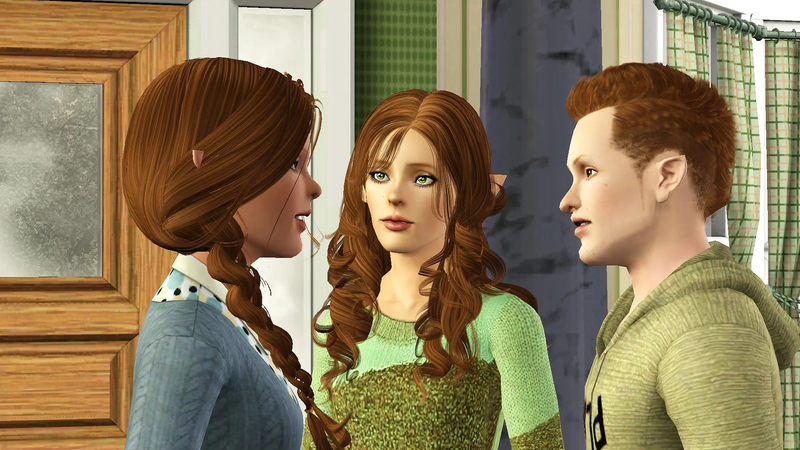 It was amazing, I couldn’t believe that the two of the them were all grown up and I was dreading what I knew came next. 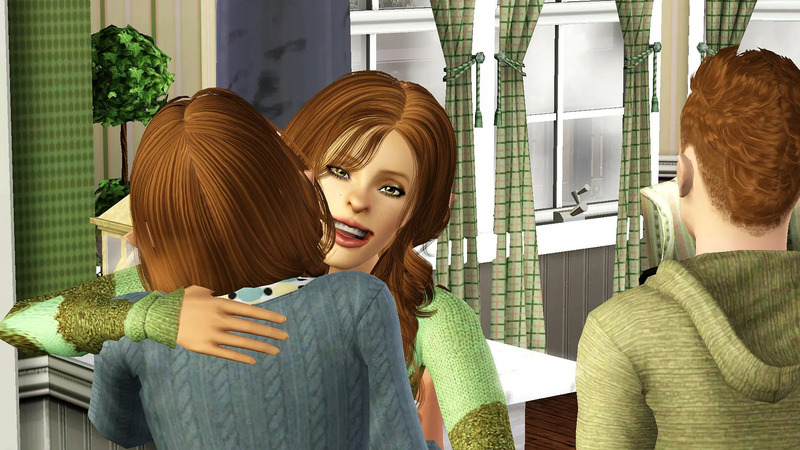 When we made home the twins prepared to move out and when they were ready came to find me. “I can’t believe your leaving. I’m not ready!” I told them. 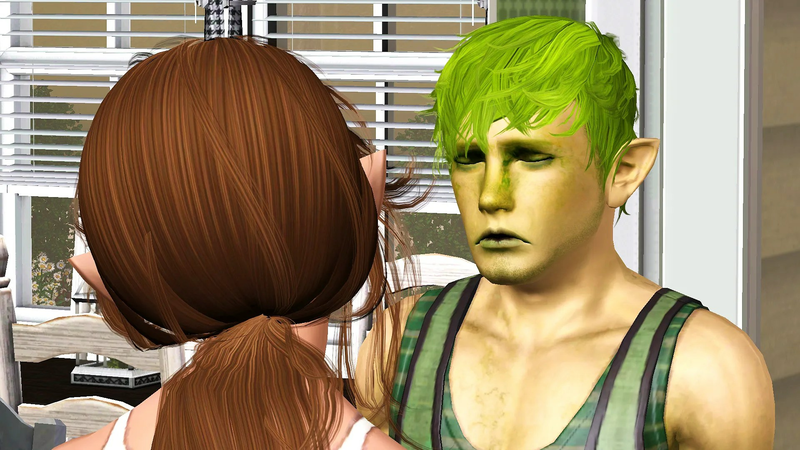 “You’re not going to cry are you?” Finch asked. “No, of course not!” I lied. “I’ll miss you” I told them as they left. 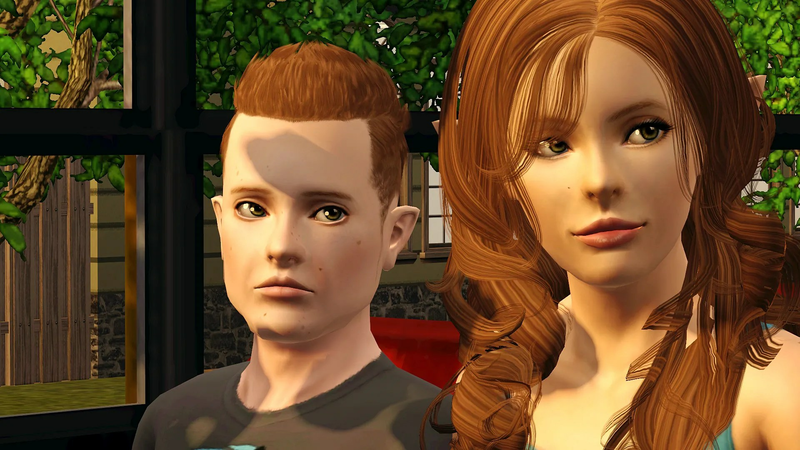 Finch and Tulip’s Leaving Home Portrait. 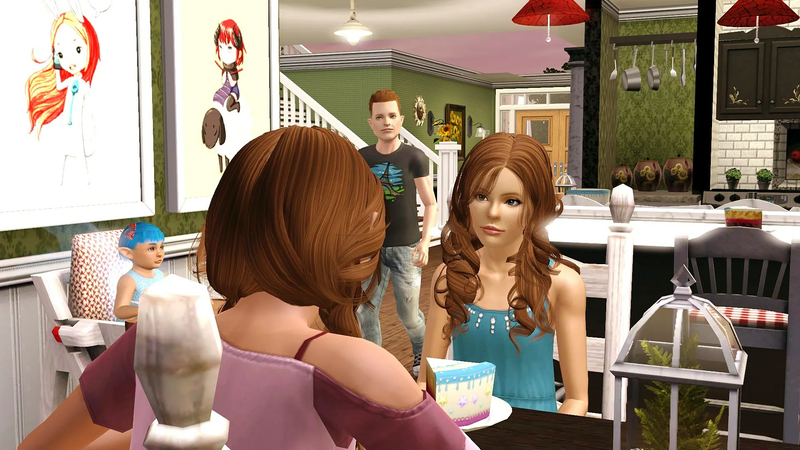 A/N: Like the last generation, all of the children are available for download. 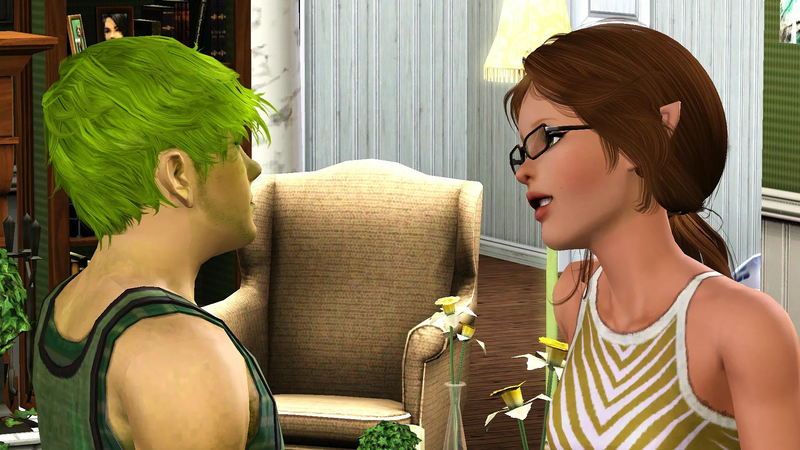 Tulip and Finch have been uploaded and are available here. 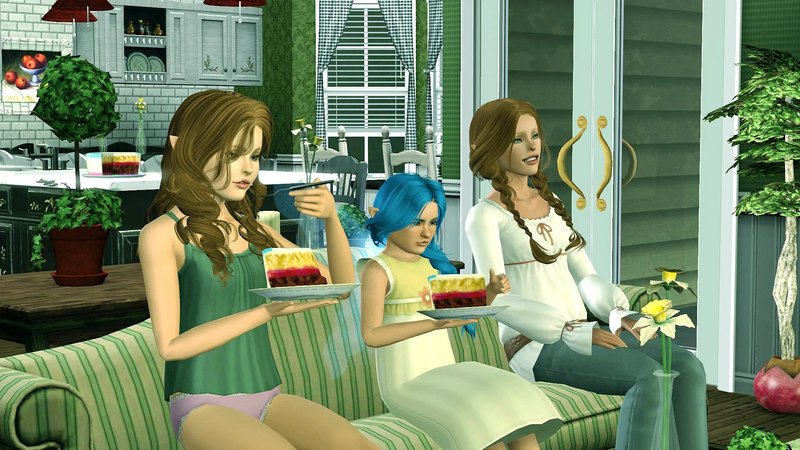 After the birthdays I sat down to watch some television with the Tulip and Calla. The children’s channel of course. Not because whenever I’m pregnant that I seem to be obsessed with the children’s channel but because Calla wanted to watch it….really! Both girls were still busily consuming cake from the recent birthdays. 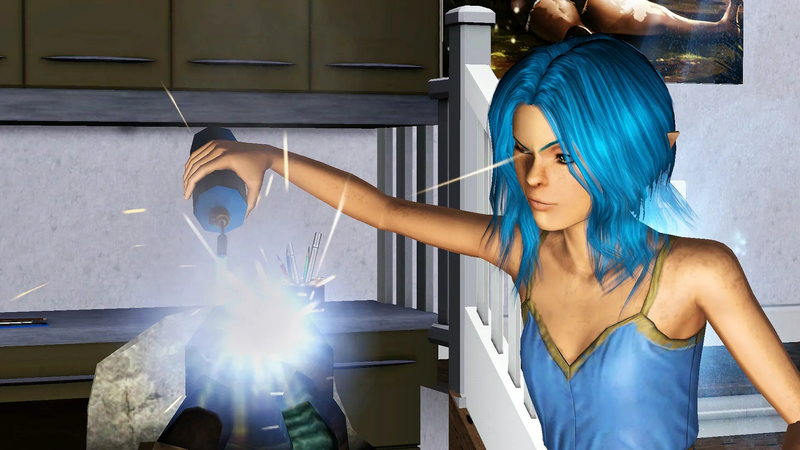 “Is that what Novus is?”, Calla asked glancing at the screen. “Is too” Tulip continued to tease her sister. 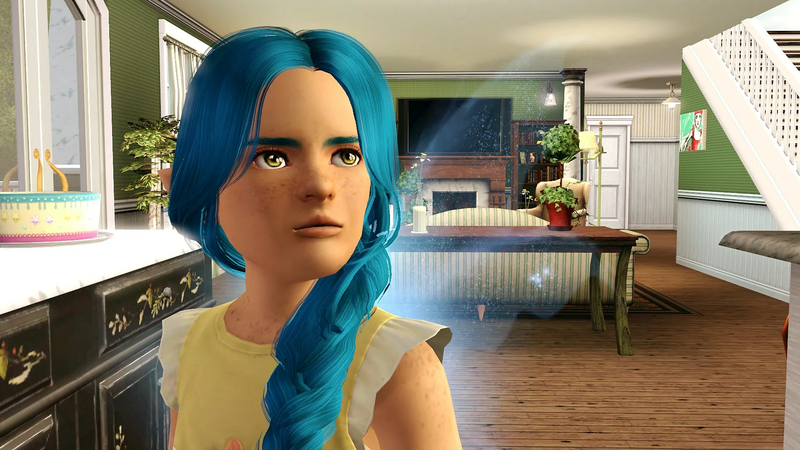 For the first time I suspected that the children, specifically Calla and Maple might have imaginary friend. 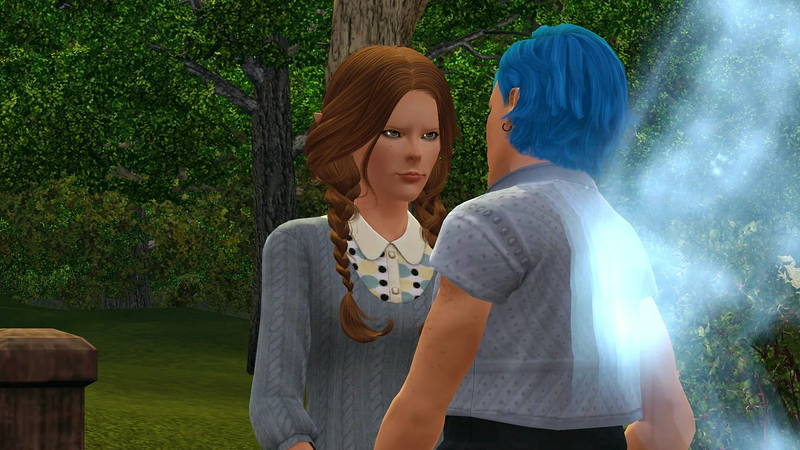 They were suddenly talking to thin air with nobody else in sight. Calla’s was named Wiggles and Maple was called Cuddles. Maple spent part of the afternoon talking about her Imaginary Friend Cuddles to her mostly uninterested big sister. 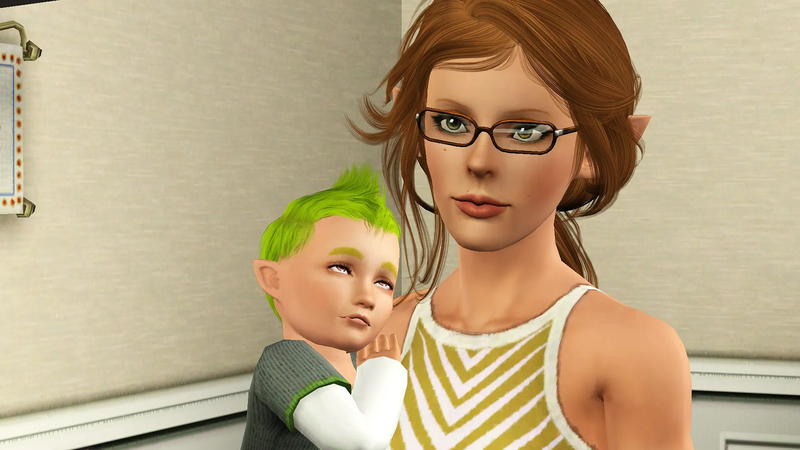 Later that night when everyone else besides my eldest son were asleep I finally went into labour. Rather than watch him freak out further I told him to keep an eye on the younger children and drove myself to the hospital. 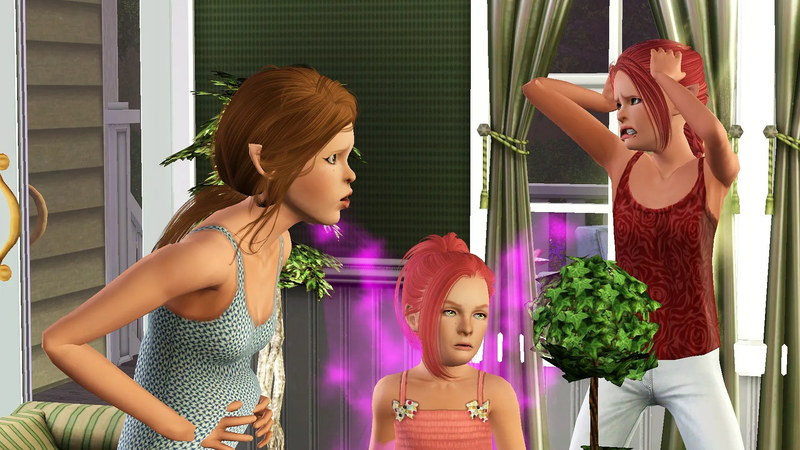 I was amazed when I came home with three more beautiful baby girls. 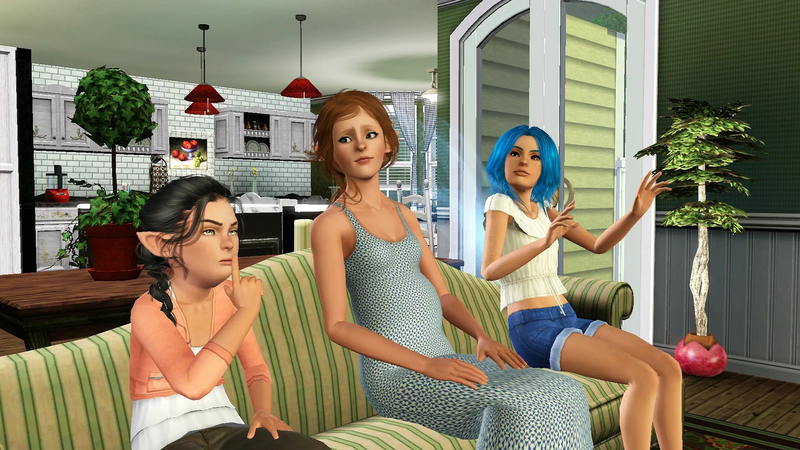 The boys were now seriously outnumbered with only two of them and seven girls. 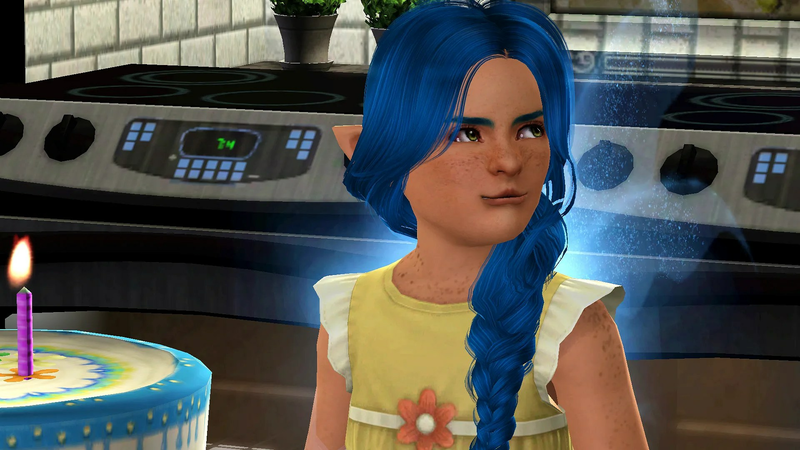 First born was Bracken, born with the traits Brave and Easily Impressed. 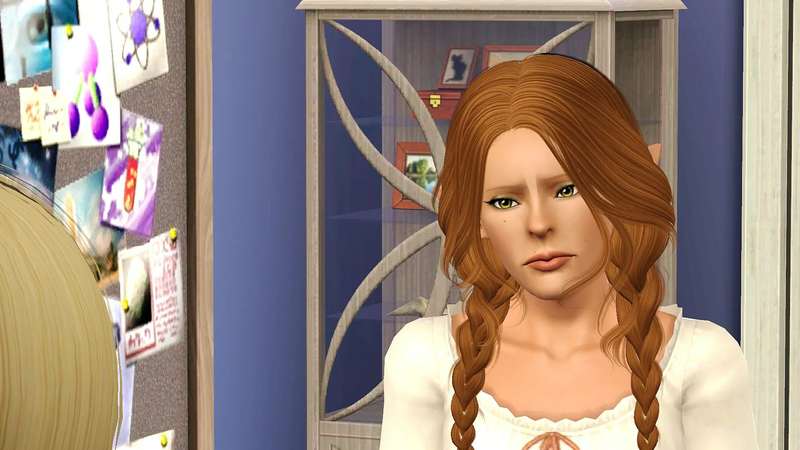 Primrose was second born and received the Evil and Loves the Outdoor traits. 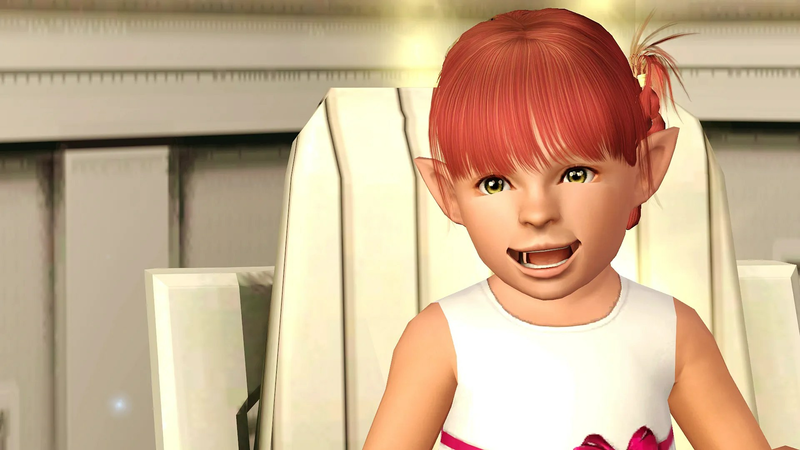 and finally Moonbeam who received the Brave and Loner traits. 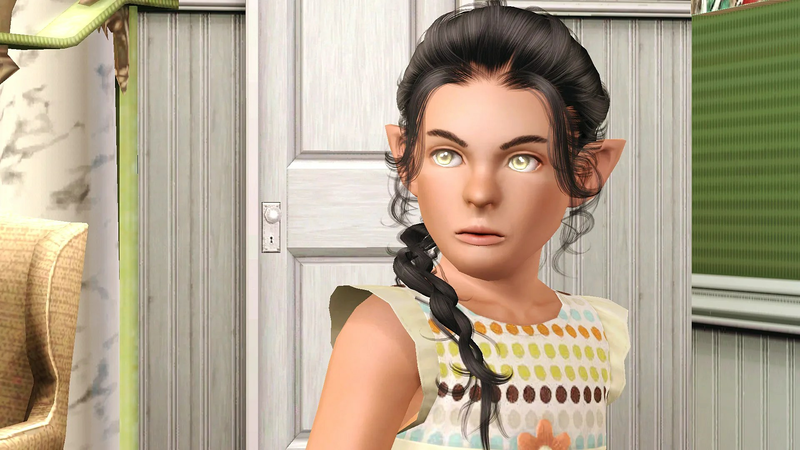 While Moonbeam was obviously a werewolf like her father, Primrose and Bracken were Fairies and I didn’t really understand how? 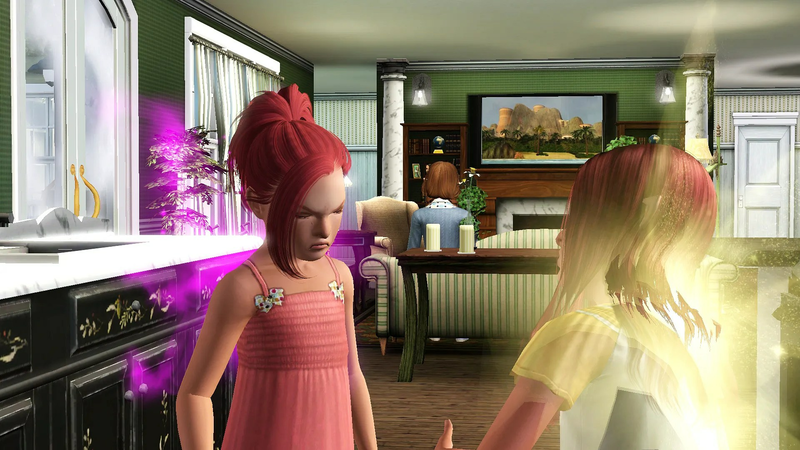 When Calla and Ruby had inherited their wings I had assumed that they had inherited their wings from their father, he had been a fairy after all but now I wondered….had they partly inherited their wings from me? I wasn’t a fairy any more and My grandmother had said that my Fairy abilities had been suppressed by my destiny. I wondered if it was possible that my children could still inherit what was now unavailable to me. I went to bed that night still pondering the entire situation. When I had slept in the following morning I had been surprised. 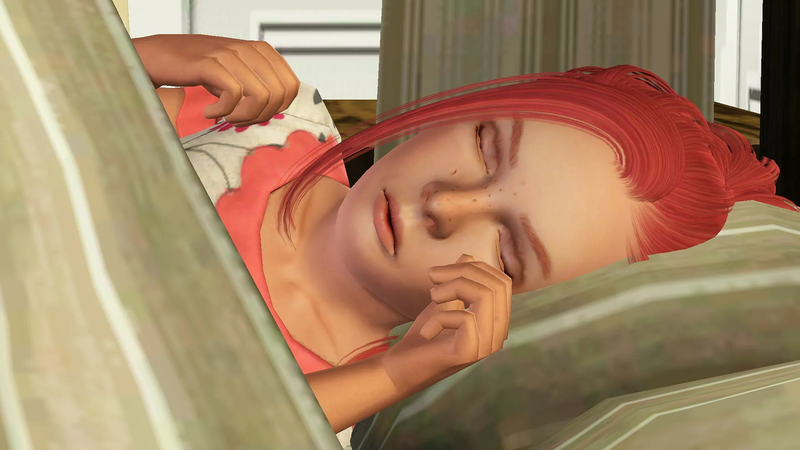 Even more so that Finch and Tulip had been taking care of the younger children so I could get some sleep. 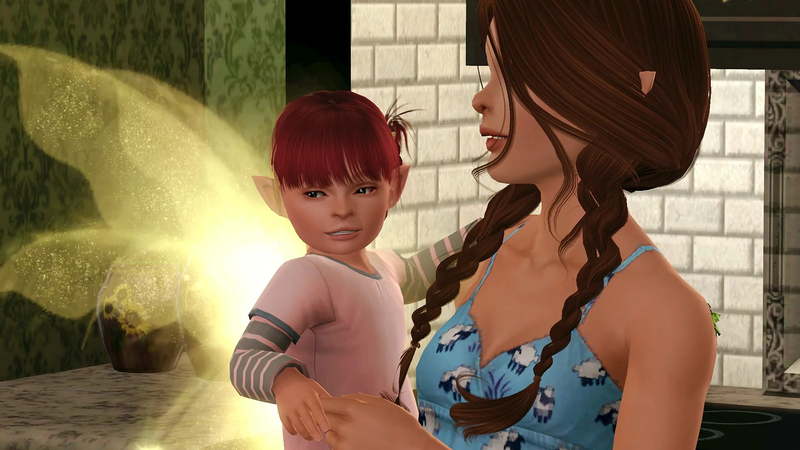 Tulip had even taught Primrose how to walk and had gotten a start on teaching her to talk. Prim had become to tired to co-operate by the time Tulip moved her training to talking and Tulip soon had to put her to bed. 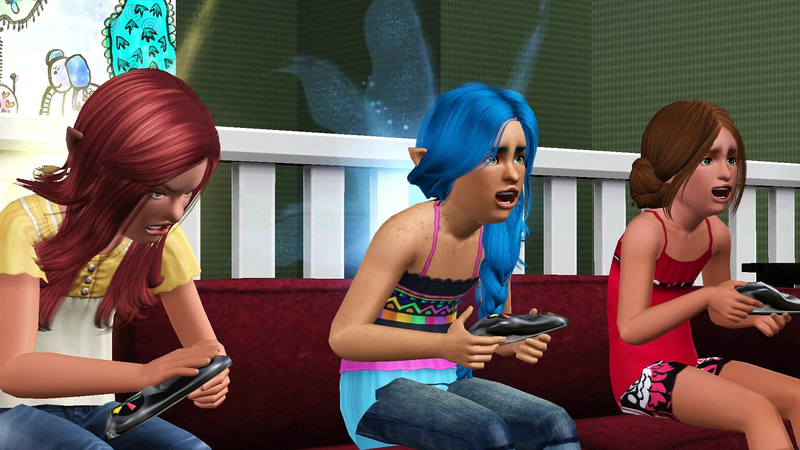 Calla, Maple and Ruby had been entertaining themselves with video games. With things calm in other areas of the house I started Moonbeam’s training. 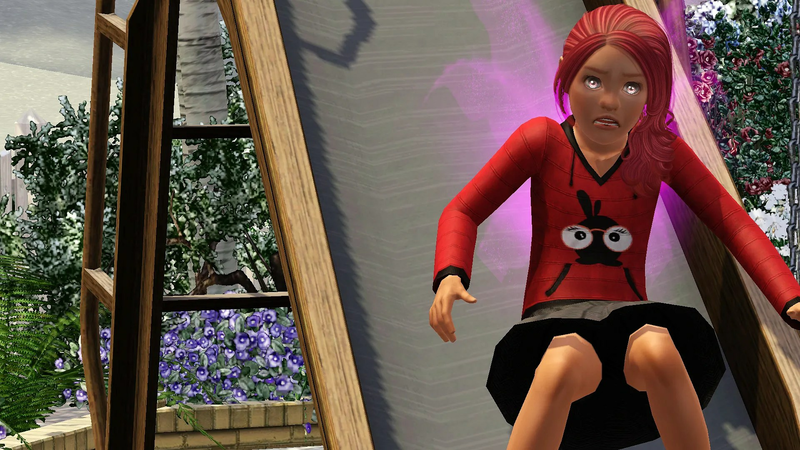 She was eager to learn, and tried to run before she could walk. 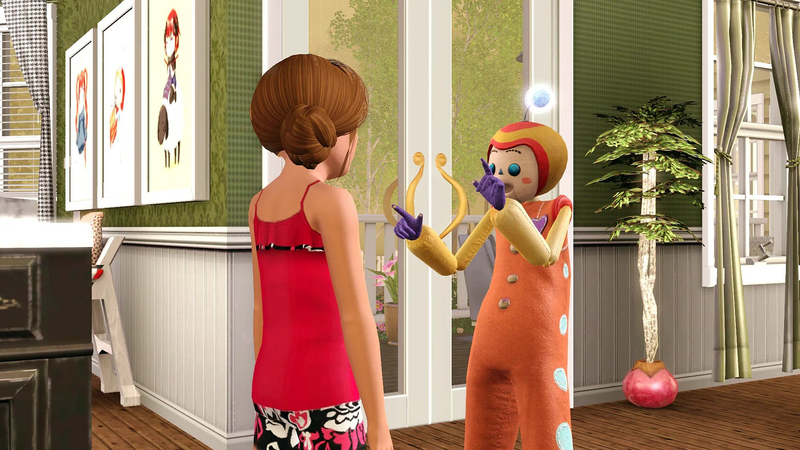 I had just finished teaching Moonbeam to walk when there was a knock on the door and I went to answer it. 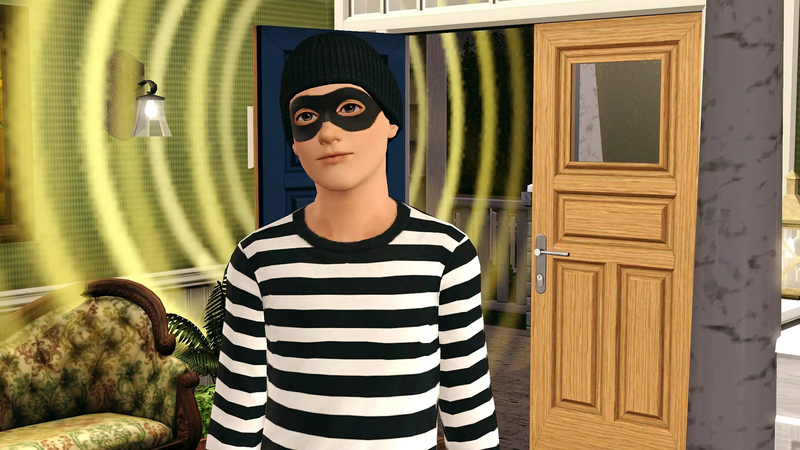 It was late when the thief entered our home and the house was unusually quiet. 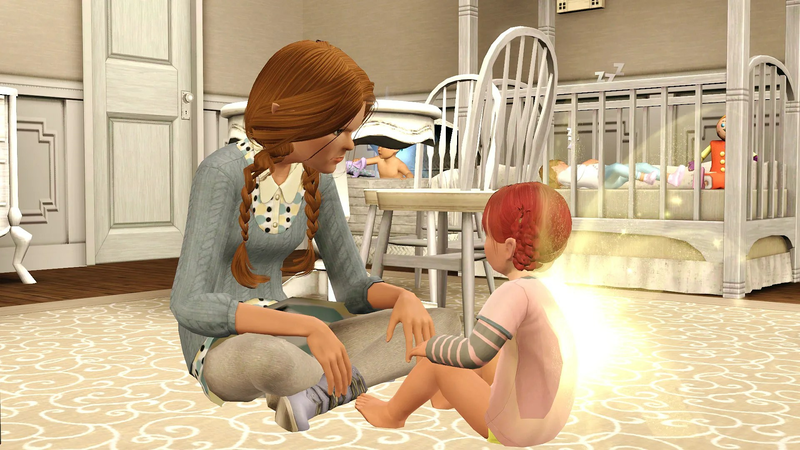 The triplets were all finally asleep after I had spent hours trying to calm them, Leon had decided to spend the night and had taken the couch in the living room and Novus was curled up beside me rather than in his own bed. It took me by surprise when the house alarm that my grandmother had insisted installing had started to sound. I was awake instantly, exhausted and confused before running to investigate the sound. On my way to the front of the house I quickly checked on the triplets and pulled their closed as I passed the nursery. I doubted that they would sleep through the alarm.When I reached the front of the house to I found Leon already taking care of our unwelcome visitor. “Need any help?” I yelled to get his attention. “Nah, I got it” Leon grinned. As I watched I realised that he hadn’t even bothered to change forms and seemed to be enjoying the contest. “What?” I stared, frozen in place. I felt a little stupid when he pointed at the alarm and I realised it was still sounding and rushed to turn it off. 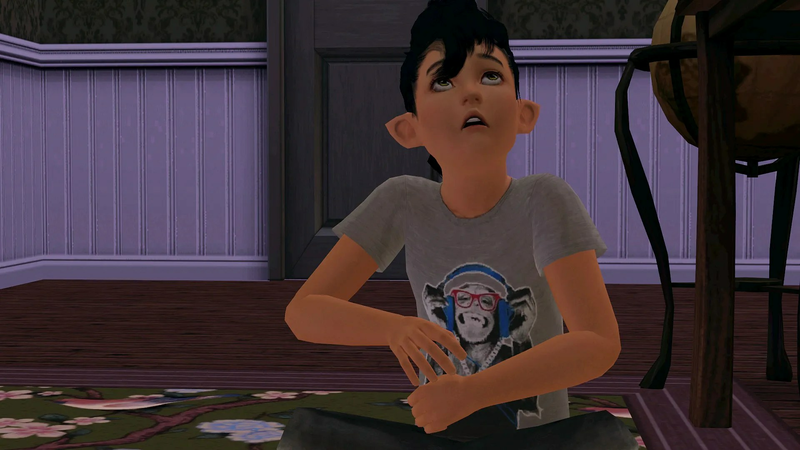 The resulting quiet revealed that the triplet were once again screaming. I glanced at Leon, he nodded indicating that he had the situation under control and that I should make sure the children were all right. It took another hour before I had them all back in their respective beds and once again settled for the night. “Thankyou for taking care of everything out here, you didn’t have to” I said, when I realised that Leon was still awake and waiting for me. I walked over to stand in front of Leon using his jacket to draw him closer me so I could embrace him. “Are the kids okay?” he asked. 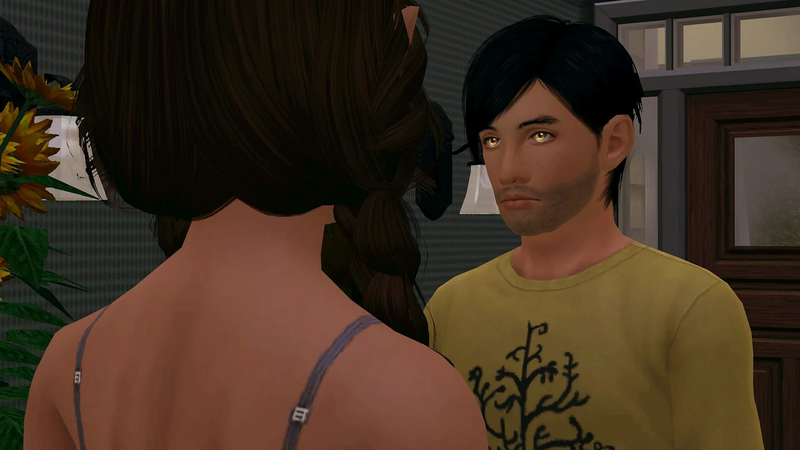 “I put Novus in with Tulip” I admitted, pulling away to look up at him. “Yeah, just tonight though, okay? 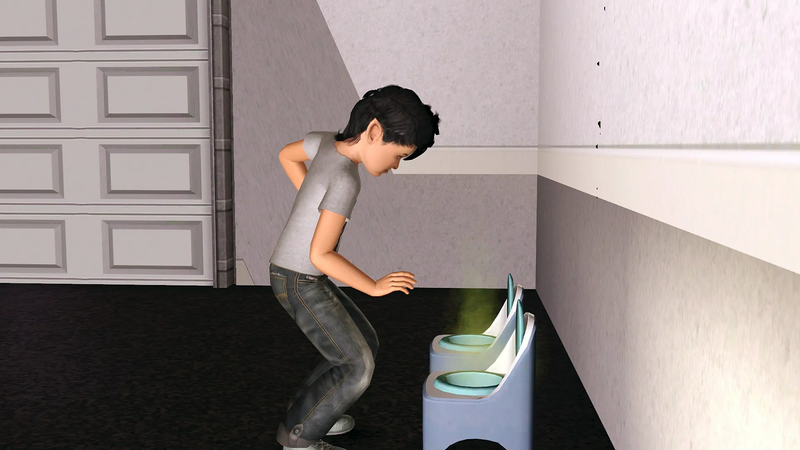 The following morning when the children woke up and Leon had said his goodbyes, promising to visit his son soon Novus happily helped me around the house including emptying the potties. 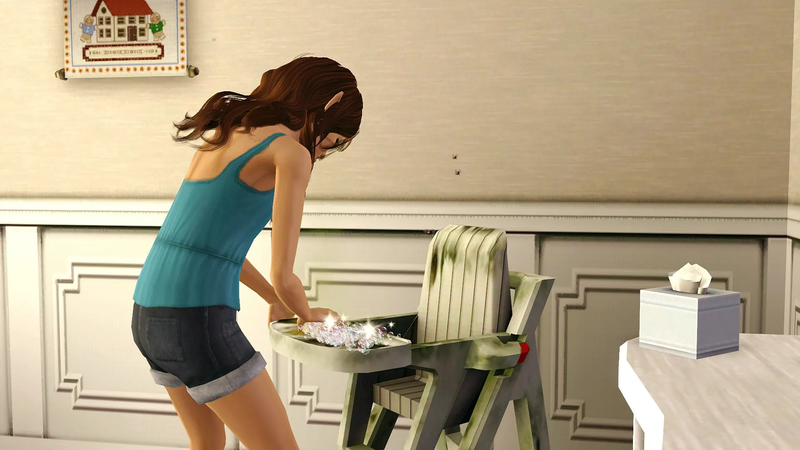 Tulip also helped out by cleaning the highchair which was once again filthy. Being the weekend the children had plenty of opportunities for fun at home. Tulip and Finch enjoyed throwing the ball around in the backyard. 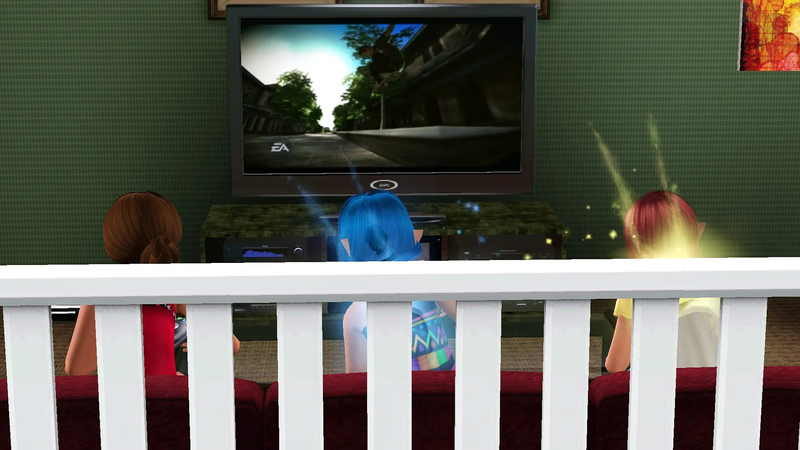 and Novus watched some television. 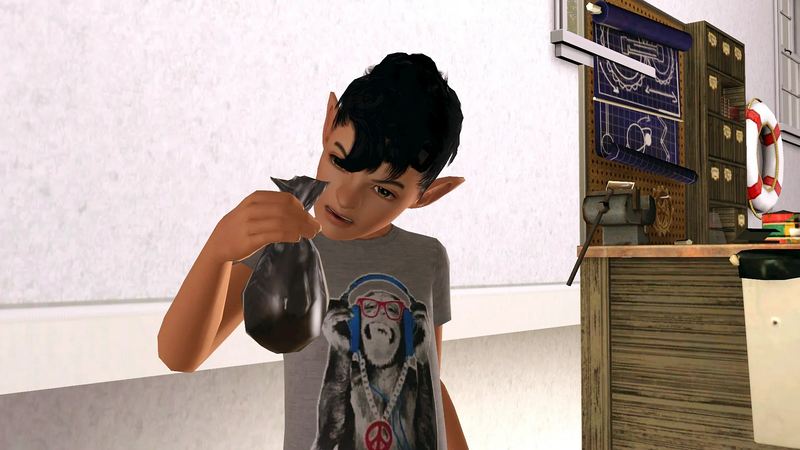 before stalking around the house in his werewolf form. 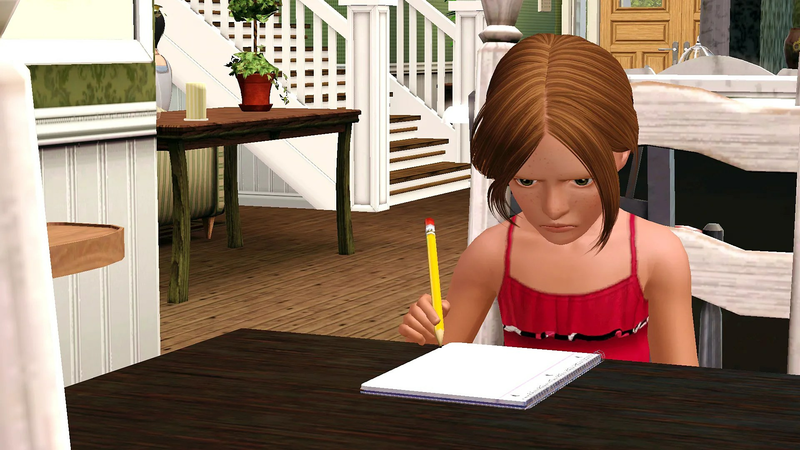 Tulip finished off her homework. Unlike Finch who’s finds all his school work a breeze Tulip has to work harder and today’s homework topic was giving her some trouble. Finch spent the evening reading. 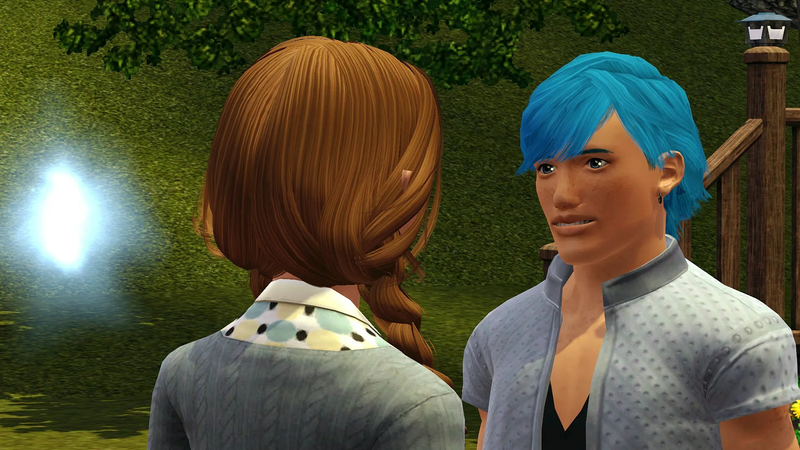 He also treated Novus to a ghost story. 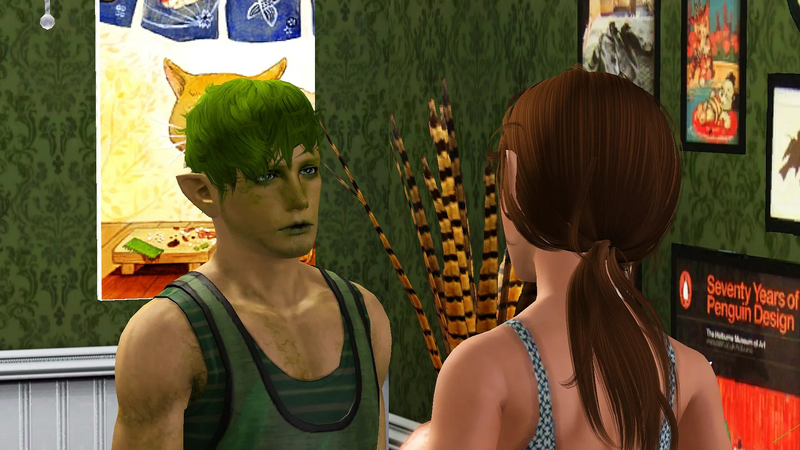 Novus seemed to become a little scared but so was I when I decided to join them. 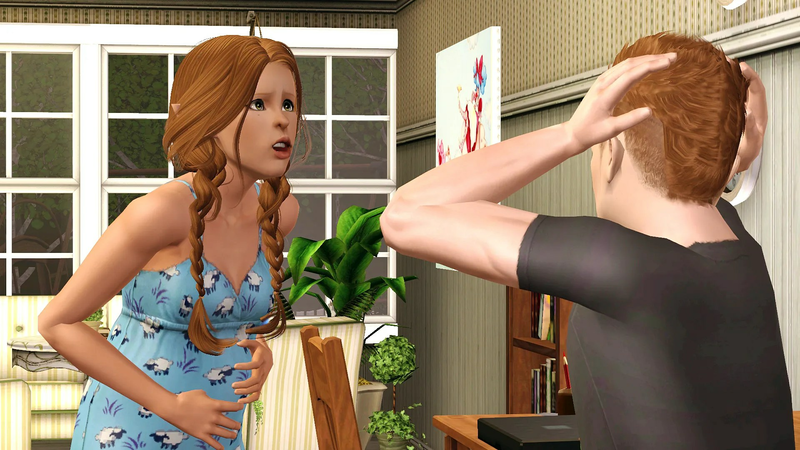 In the morning I realised I was once again pregnant. The other night with Leon had been stupid and careless. One of the things my grandmother had told me was that it would be easier if it was only one pregnancy per father. Less chance for either party to become attached. I knew that there could be exceptions but this early could only lead to disaster. 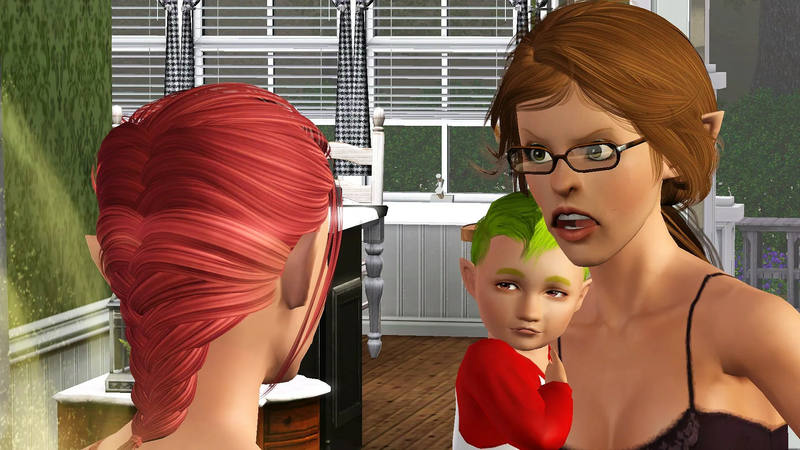 I consoled myself that I had already given birth to triplets and they had obviously all counted. 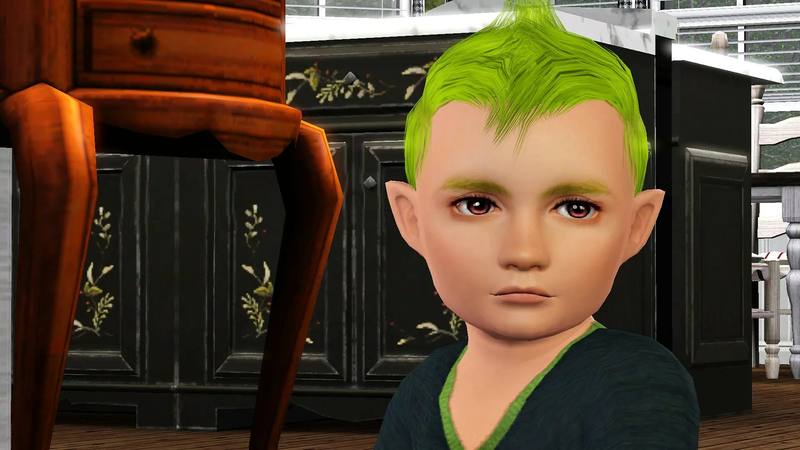 Novus had been a single birth so at least I knew that a couple of the babies would count towards my total. 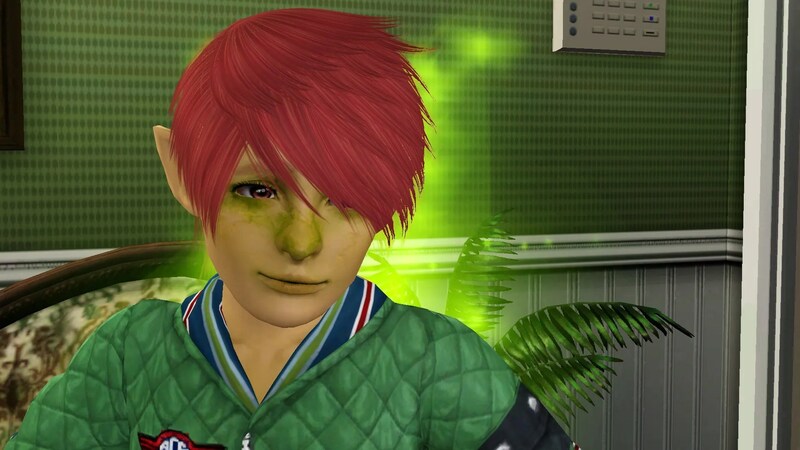 I knew I was going to have to call Leon and tell him the news and considering how he was with Novus I was going to be seeing him again. I wasn’t really sure how I felt about that. 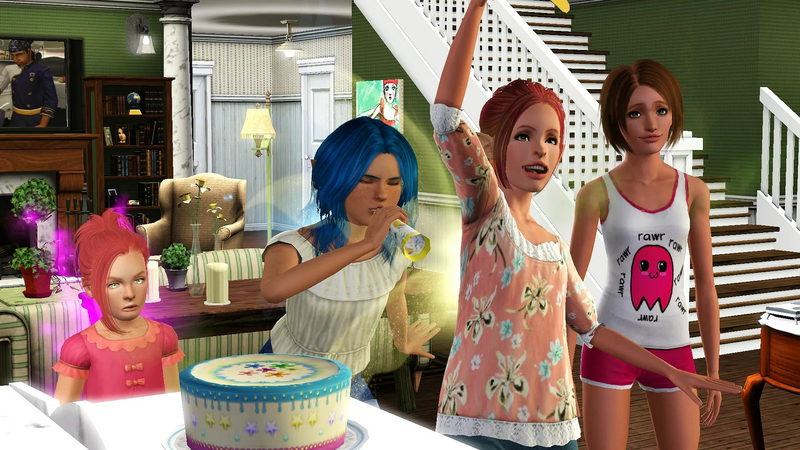 With new children on the way it was time for the triplets to celebrate their birthdays. Little Ruby who looked so much like my sisters was the first of triplets to be brought to the cake. 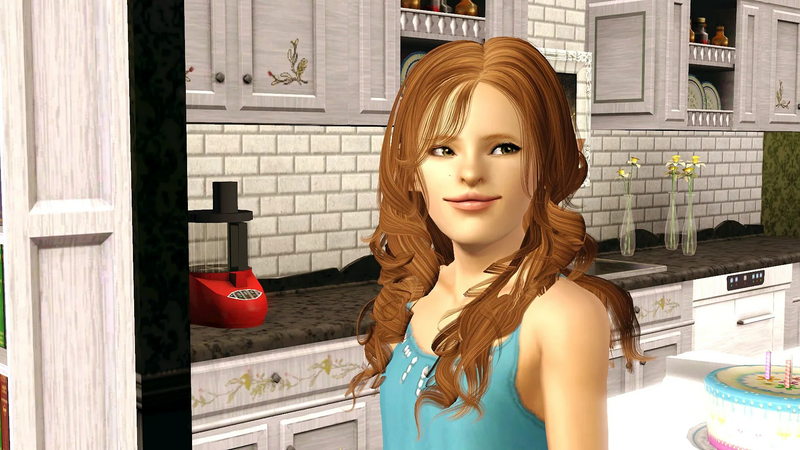 Ruby received the Over-Emotional trait and after her age-up her resemblance to my sister’s only grew stronger. 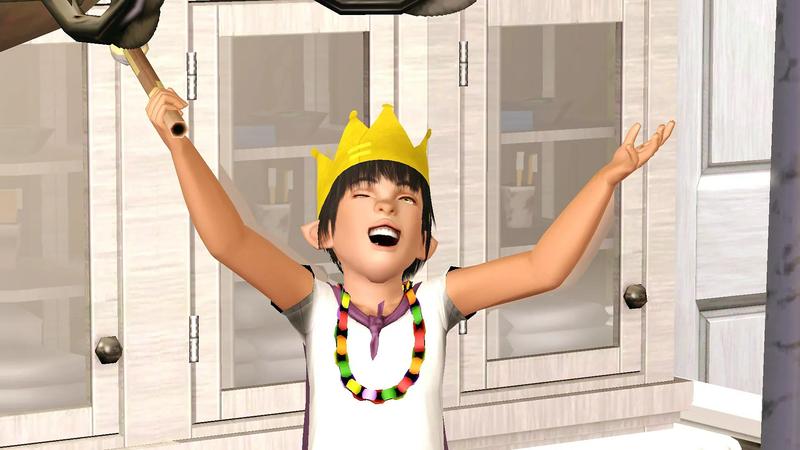 She received the Computer Whiz trait. 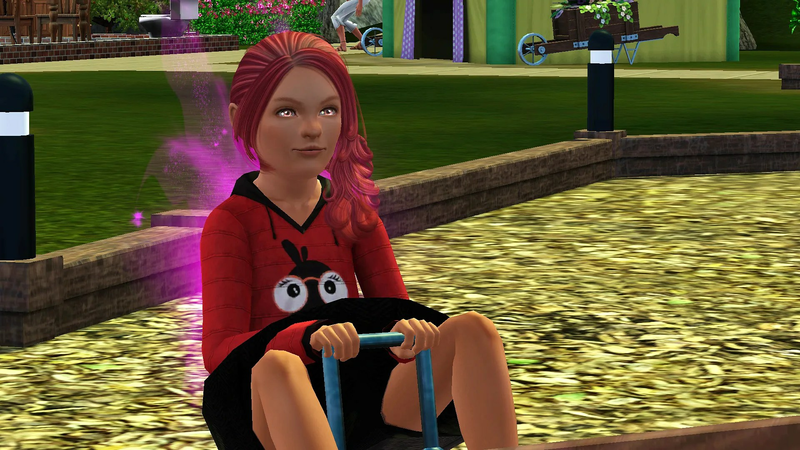 and finally Calla who received the Couch Potato trait. 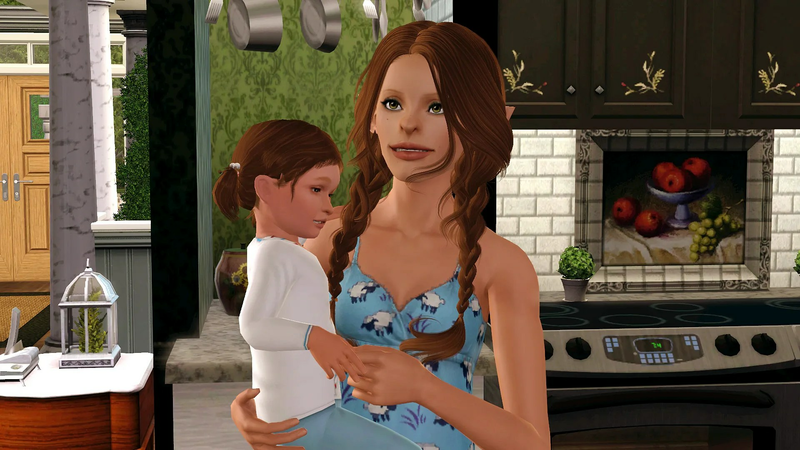 I seem to have spent my entire pregnancy tinkering – with varying results. 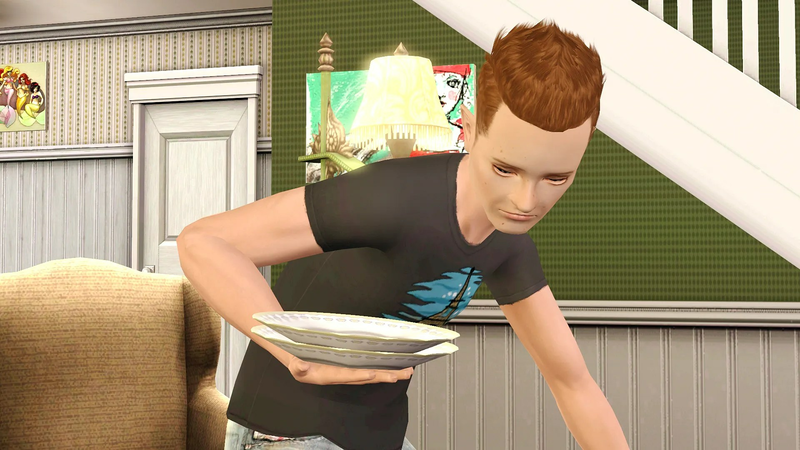 When I have haven’t been at my table trying to make some more items to sell. 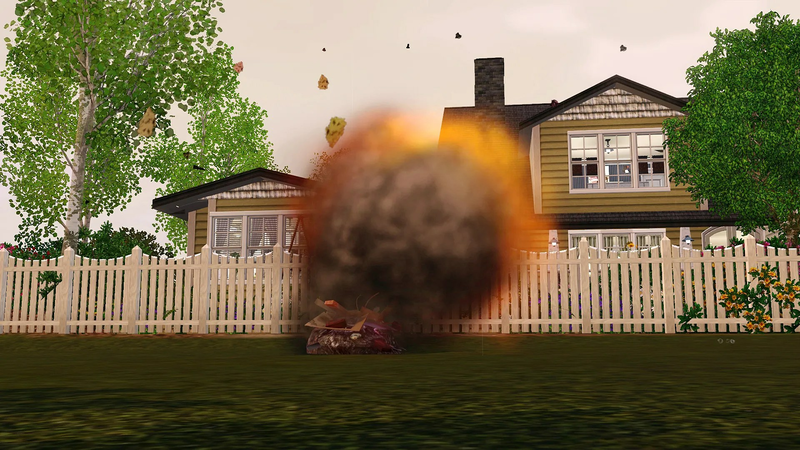 I’ve been in the vacant lot behind the house – blowing things up. I believe that I may have enjoyed that a little more than I should have. 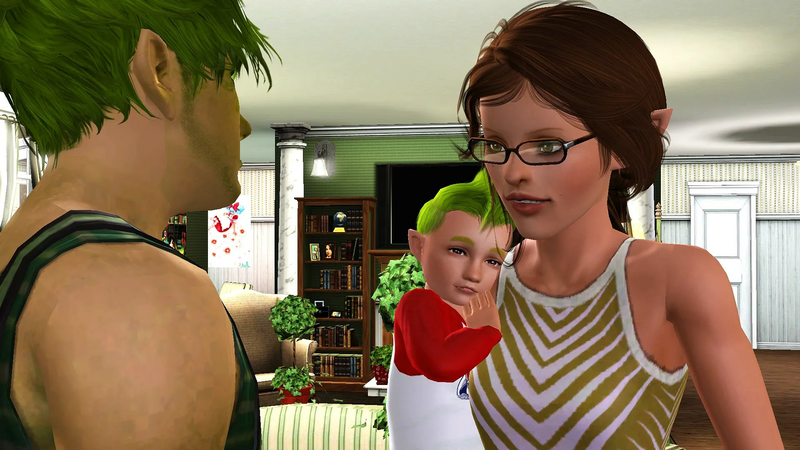 I was out there with Novus and Tulip when I finally went into labour. Unfortunately the two of them panicked and rather than upset them further I called the babysitter and drove myself to the hospital. I was at the hospital for longer than I expected. 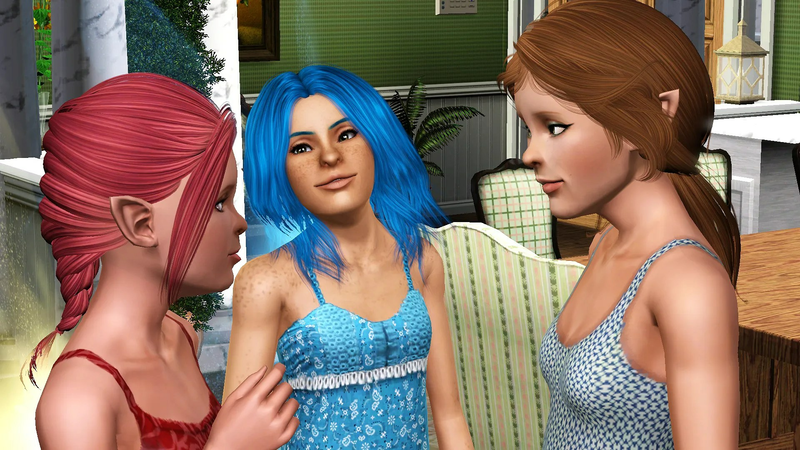 I am now the mother of triplets, all girls. 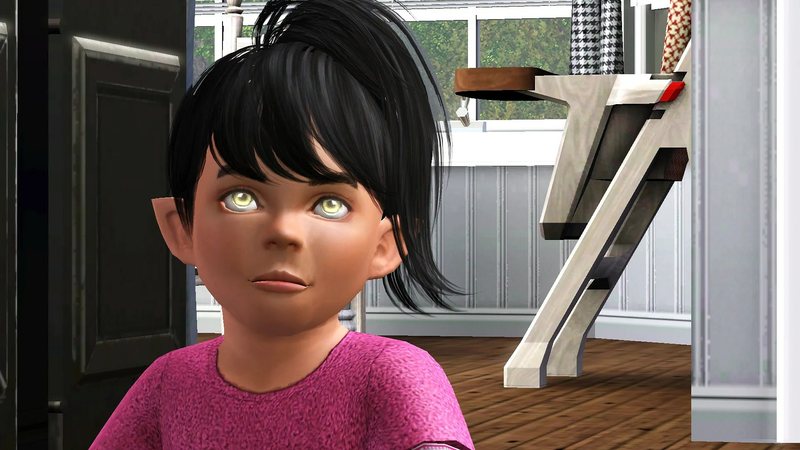 Ruby was first-born and has the Couch Potato and Good traits. 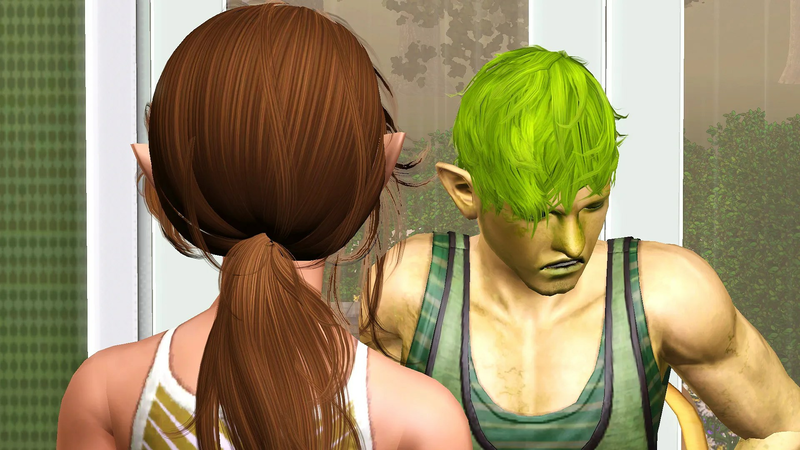 I was pleased to see that she had inherited my father’s hair colour. I couldn’t wait to tell him. Surprisingly her wings were also the same colour mine had been. 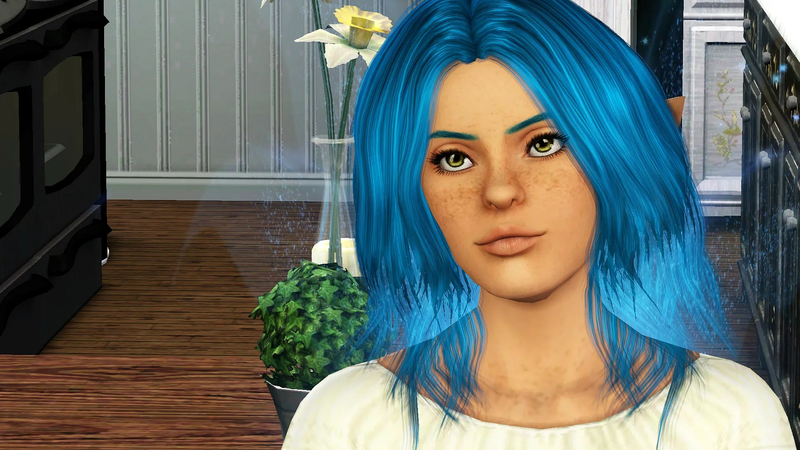 Calla was next, she was born with the traits Eccentric and Friendly. 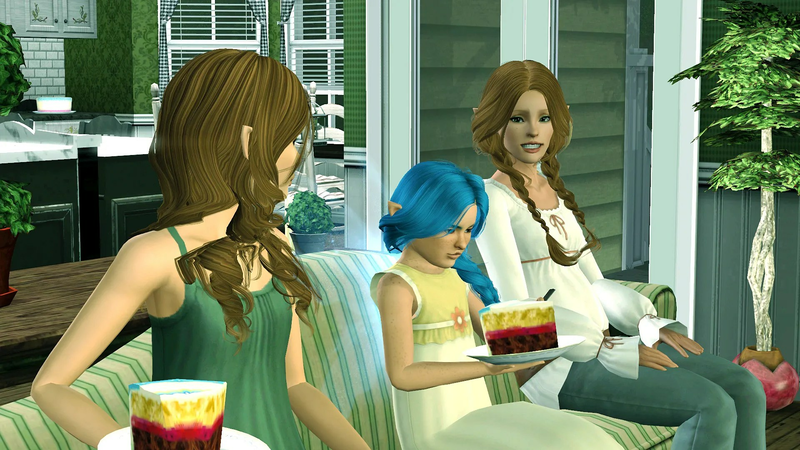 Of the three girls Calla had inherited most of her colouring from her father, only her eye colour came from me. 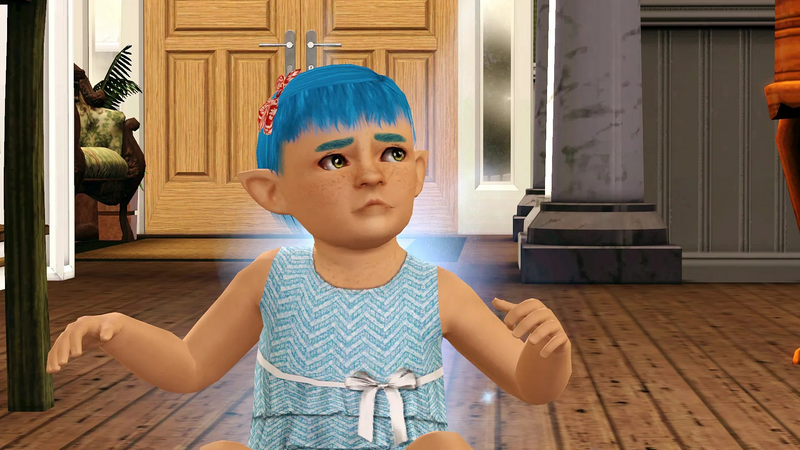 and finally Maple who was born with the traits Friendly and Good. 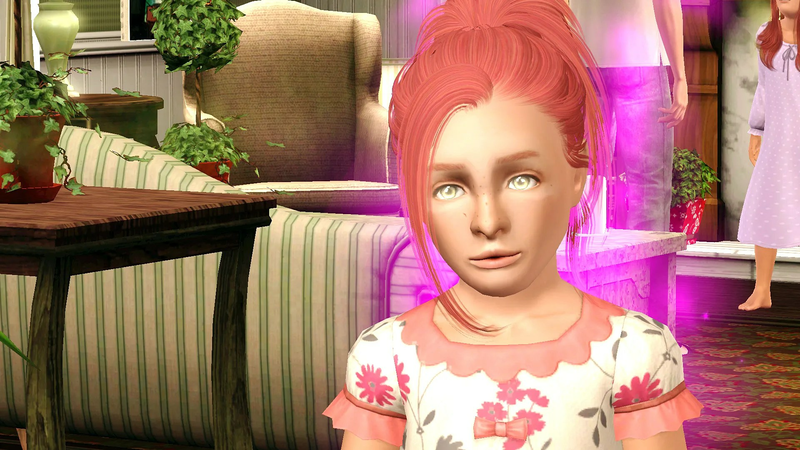 I wasn’t certain but I thought that Maple might have inherited my father’s pink skin-tone. 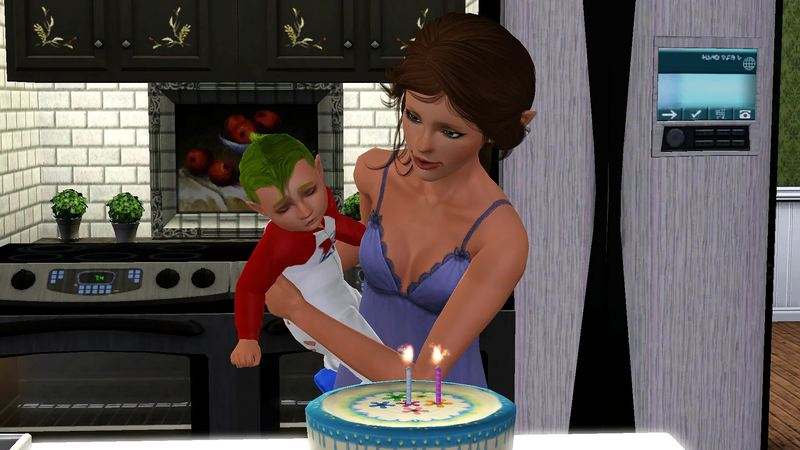 With three new toddlers in the house I realised that the Tulip and Finch were overdue for their birthdays. I had been delaying the birthdays for far too long, not wanting my older children to grow up but it was time. 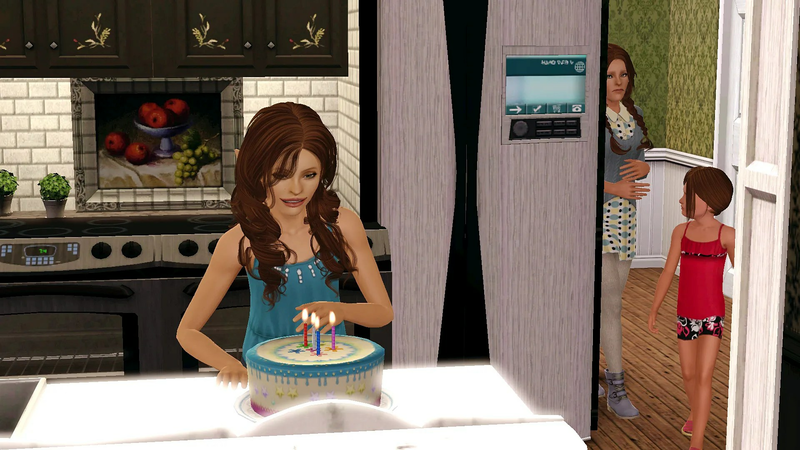 Both of the twins stepped up to the cake to blow out their candles. 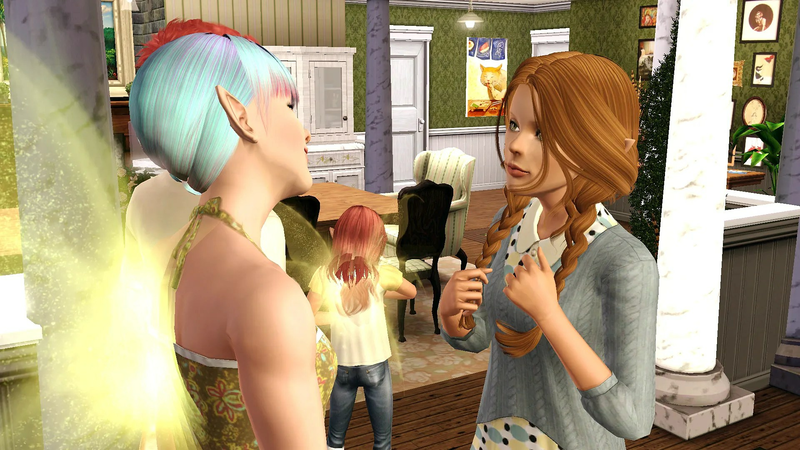 Tulip received the Cat Person trait. 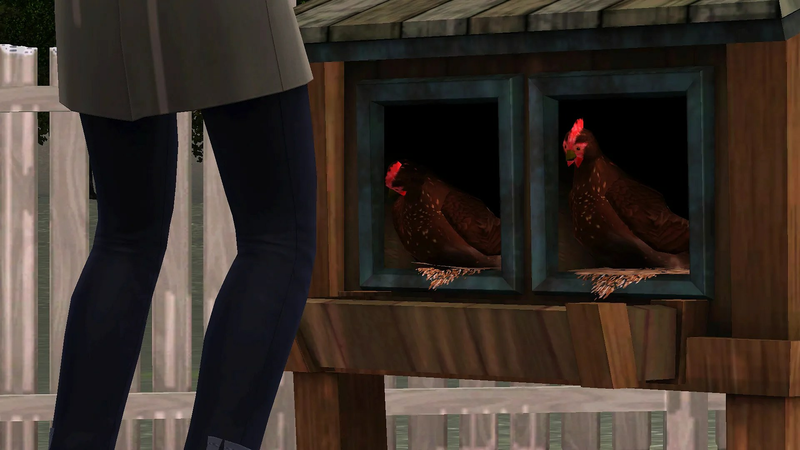 while her twin Finch received the Coward trait. 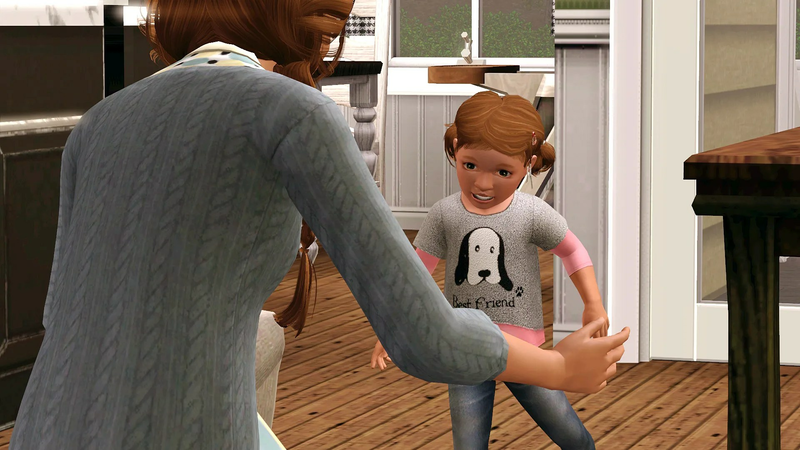 With Tulip and Finch now teenagers I decided to get started on Ruby’s toddler training. 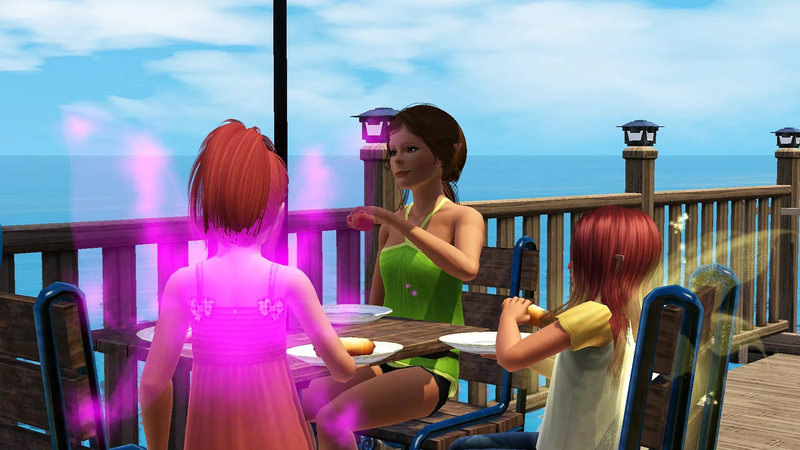 With her pink hair and yellow wings Ruby reminded me a lot of my younger sisters especially Nadine and Haley. Ruby’s training went well and when it became clear that she had enough I switched to Maple and stared teaching her to walk. Both Finch and Tulip both helped out around the house it didn’t matter if cleaning up the dishes or helping with the triplets, I was grateful for the help. Unfortunately for me, they had to attend school. I’m sure they enjoyed being out of the house and with their friends. Novus kept himself busy. When I had the time I would stop what I was doing just to watch him pretend to drive his car. 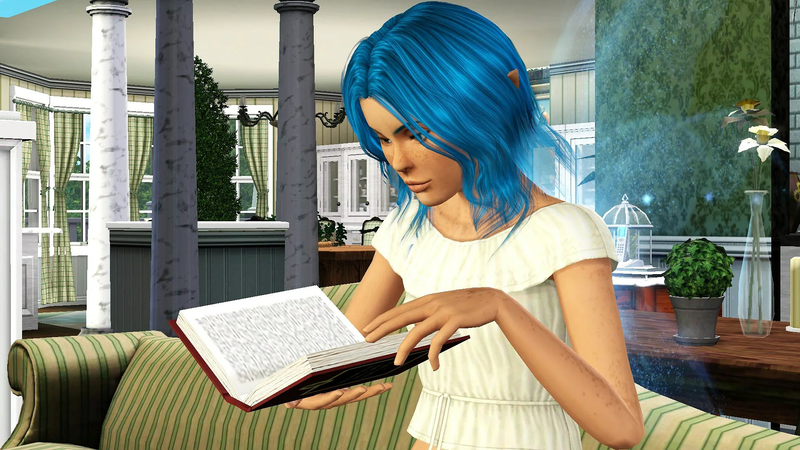 Tulip read a bedtime story to her brother Novus, even though she now had the little sister’s that she had originally wished for. 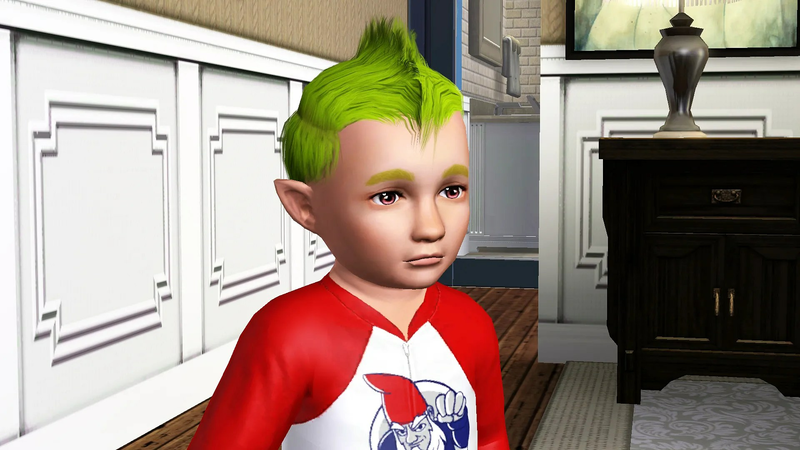 The following morning Novus could not contain his excitement. I had received a phone call from Leon the night before and he was going to visit us to meet his son. I’m not sure if he realised how big Novus would be as I had failed to mention the children’s accelerated growth rate the last time we had seen each other. 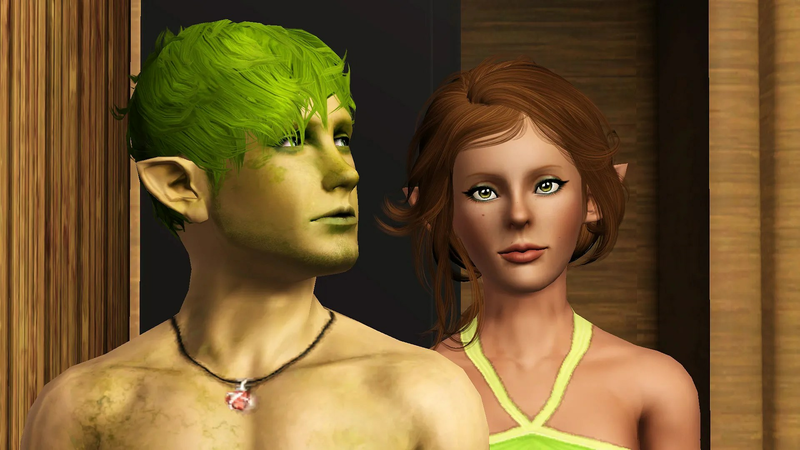 Finch and Tulip were a little curious as to why Novus’s dad would be visiting when their’s hadn’t even attempted to keep in contact. 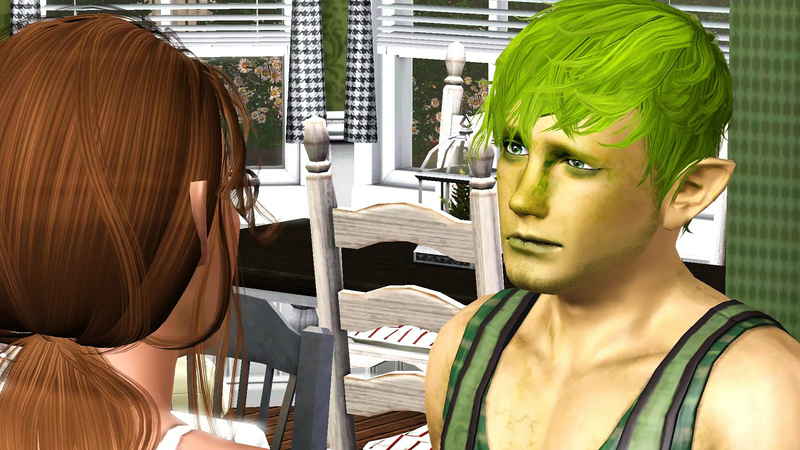 “Yeah, why?” Finch asked, taking Calla out of her high chair and coming closer to hear what I had to say. 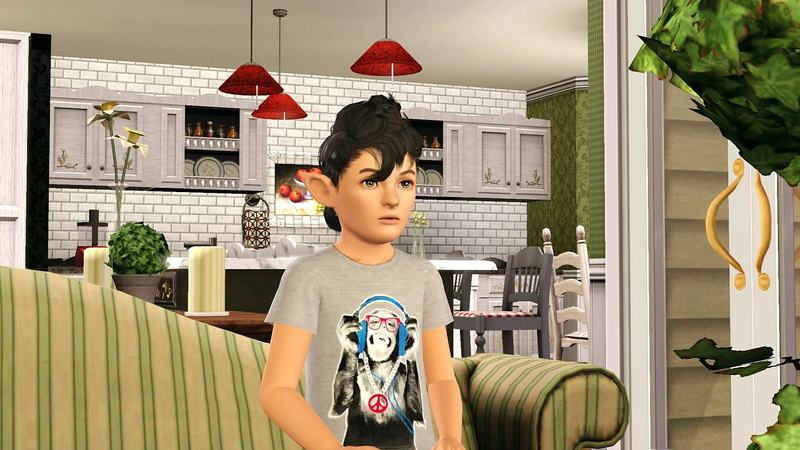 When Leon arrived a couple of hours later, I had answered most of Tulip and Finch’s questions and they had decided to help me out today by looking after the younger children while Leon was visiting. They did a wonderful job keeping the triplets occupied and feed while I was busy. 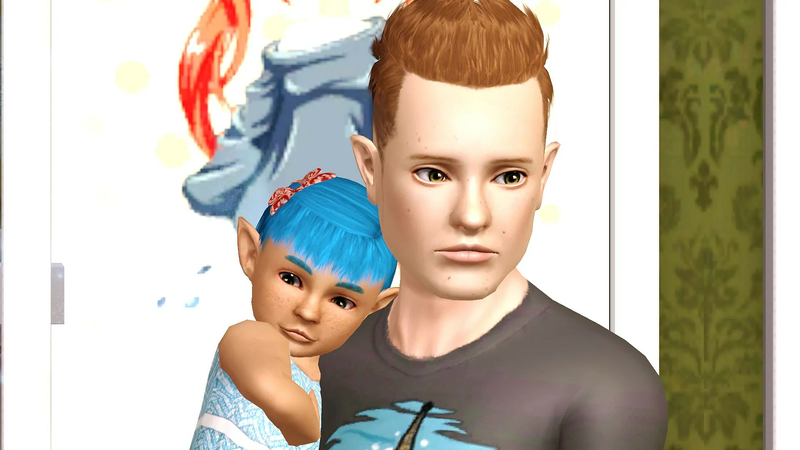 “So your my dad?” Novus asked when I took Leon up to meet him. “Yes, Novus I am. It great to finally meet you” Leon spoke to his son. 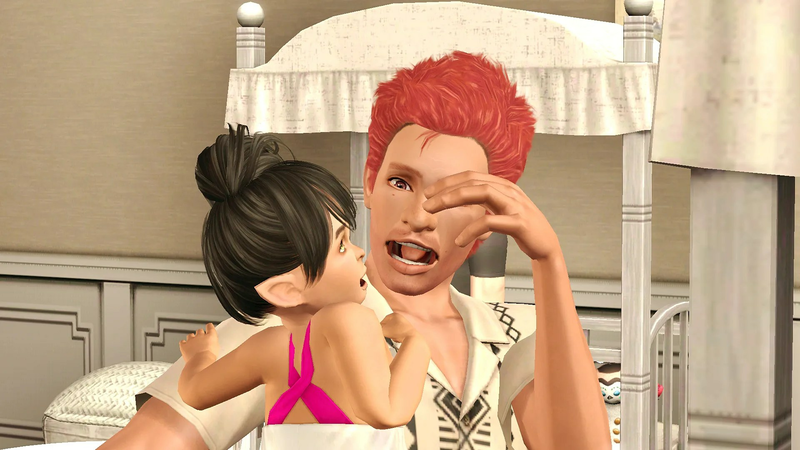 “Mum says your the reason I can do that pointy teeth thing and destroy furniture when I don’t really mean to” Novus told him. 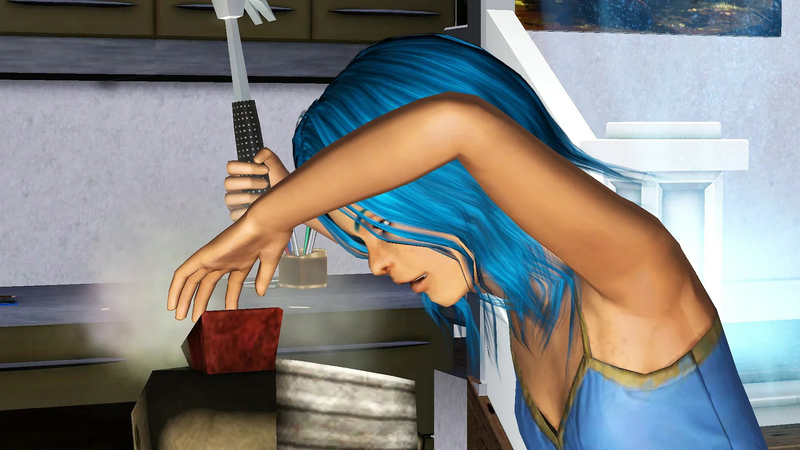 Leon glanced back towards me, laughing. “Right” Leon said, turning back to his son. “Do you have any questions? Do you want me to explain it to you?” he asked Novus. I backed quietly away, they seemed to be getting along well and they deserved to have some time to themselves. 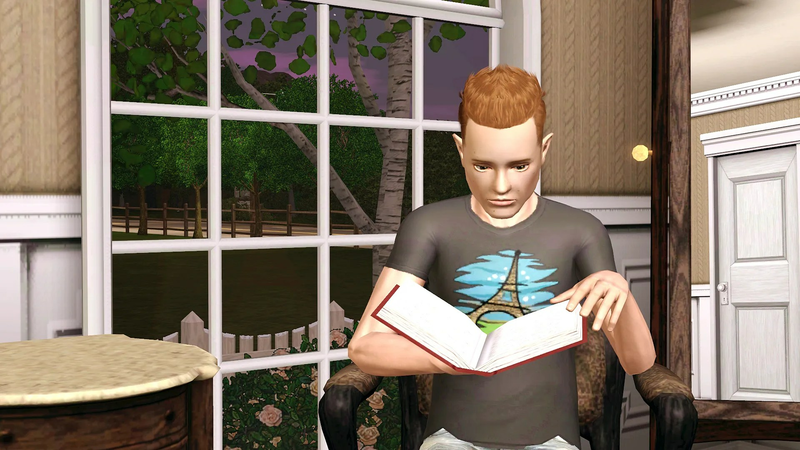 When I finally went to find them later, they were both in wolf form and Leon was reading Novus a bedtime story. “Thankyou” I said, the hug felt nice. It would have been so easy to stay there. I sighed as I pulled away. All three of my children were now old enough to be at school and during the day when I wasn’t tinkering I was often at a loss for something to do. I knew I was going to have to track down another father soon. 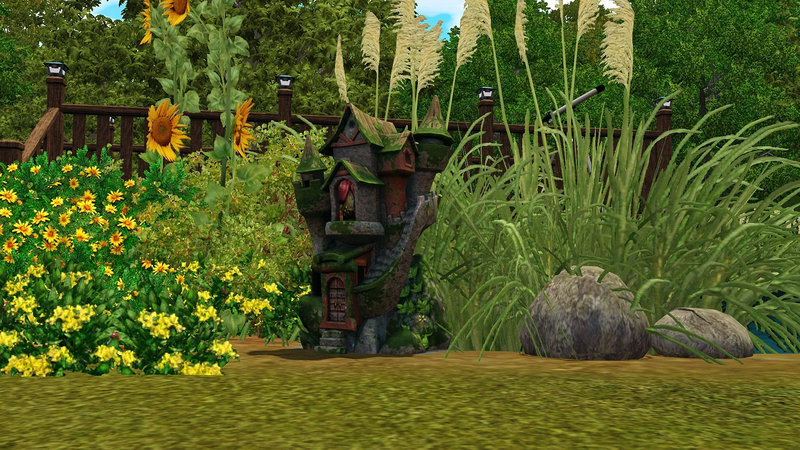 I decided to go for a walk and as I was walking I came across a couple of fairy houses. I was curious. 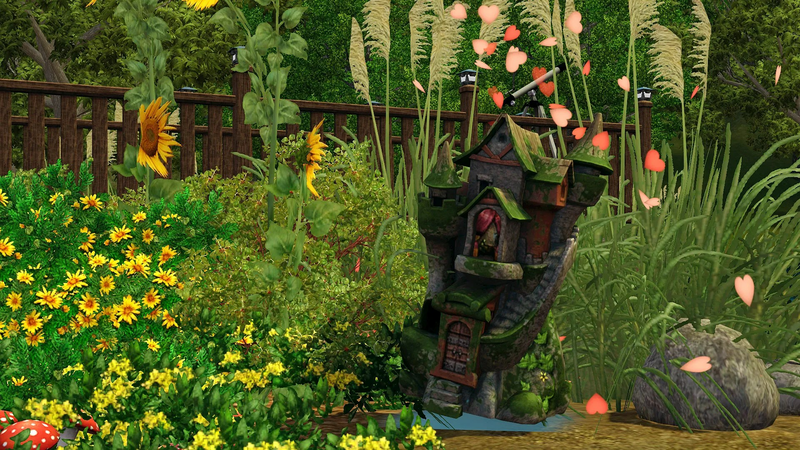 I had heard of fairy houses before but despite being a fairy for the first nineteen years of my life I had never seen one before. It was something Mum had never been interested in owning. 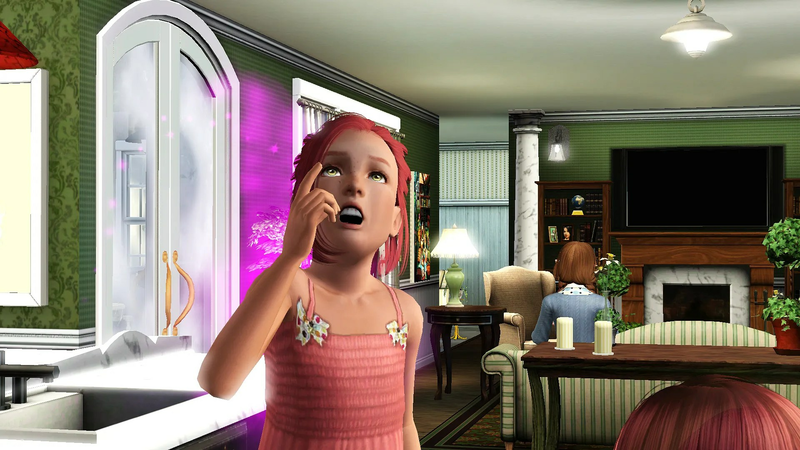 She had liked having a home that all of her family could enjoy not just those that had taken after her. It wasn’t long before the owner of the house came to investigate. I realised I had been staring. He flew around me, so quickly I could barely keep track as he circled around my head. Tiny wings brushing gently against my face. “For us? 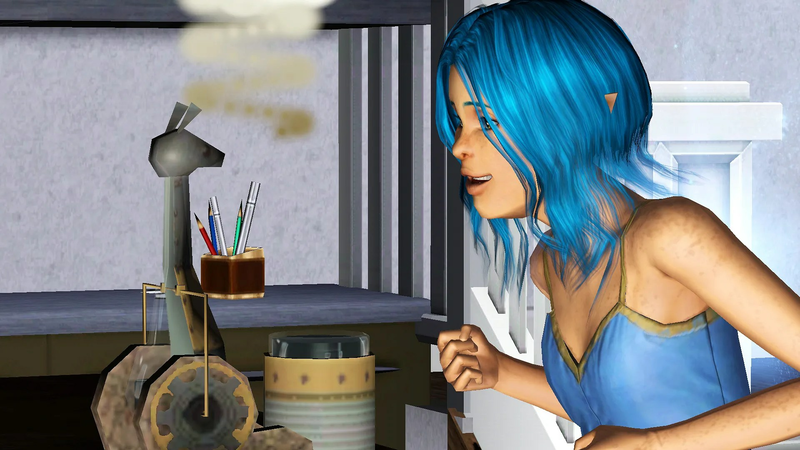 But you are not a fairy?” Kobi asked, obviously confused. Kobi didn’t respond, waiting for me to continue. “It’s complicated” I finally answered. “How so?” he asked, taking my hand. “It sounds like it is” he remarked. “Would you like to see inside?”, he asked. “And who told you that?” he laughed. “I might have guessed.” he laughed, giving me a knowing look. “Oh!” I finally realised what he was asking. 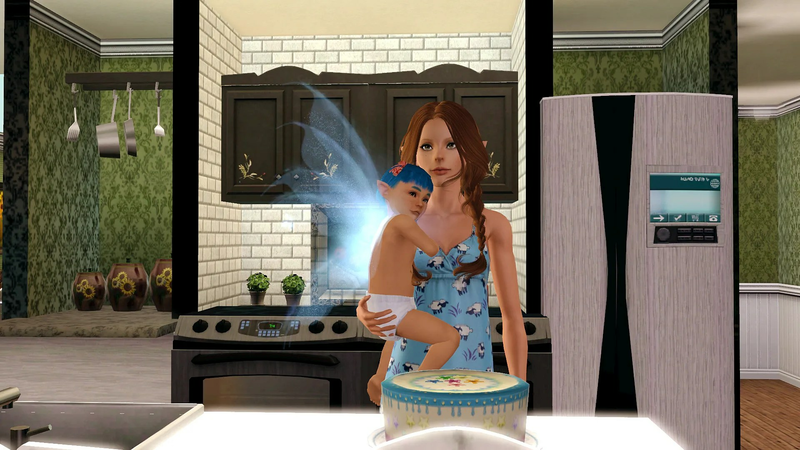 Being who I was, there was really one way I could answer when a blue eyed and blue winged fairy asked me into his home.